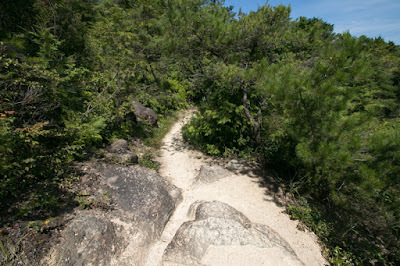 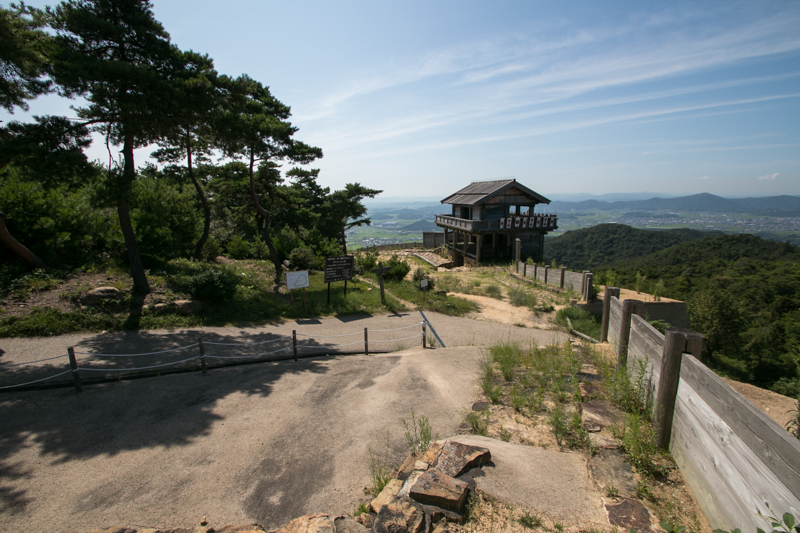 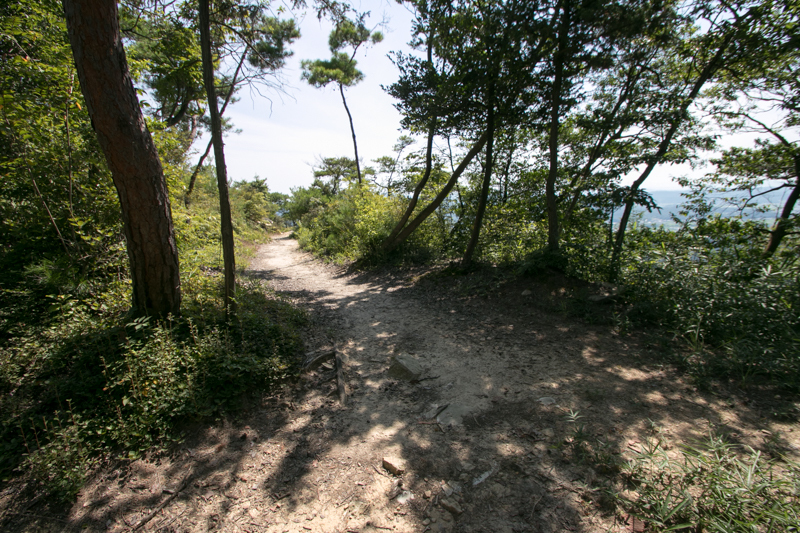 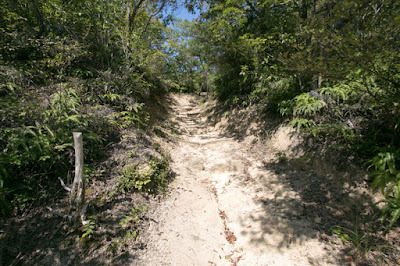 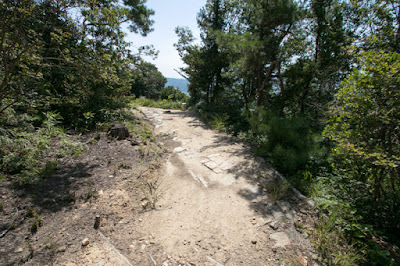 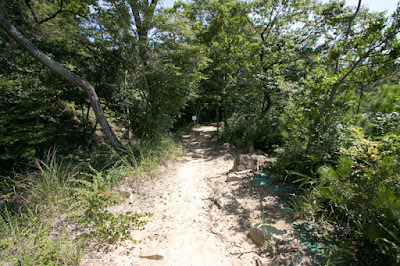 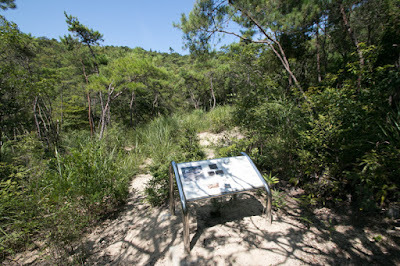 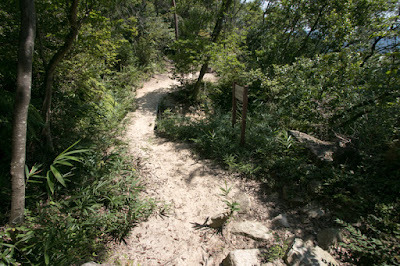 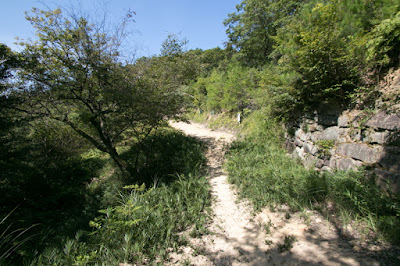 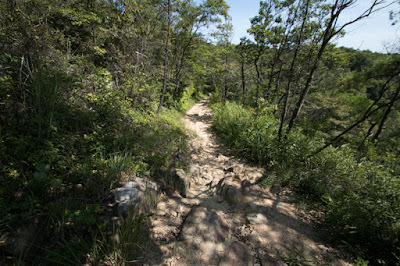 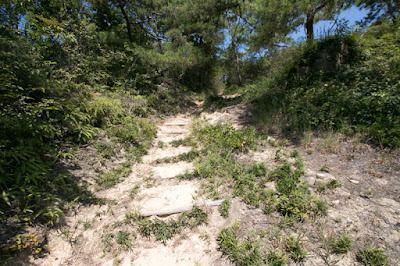 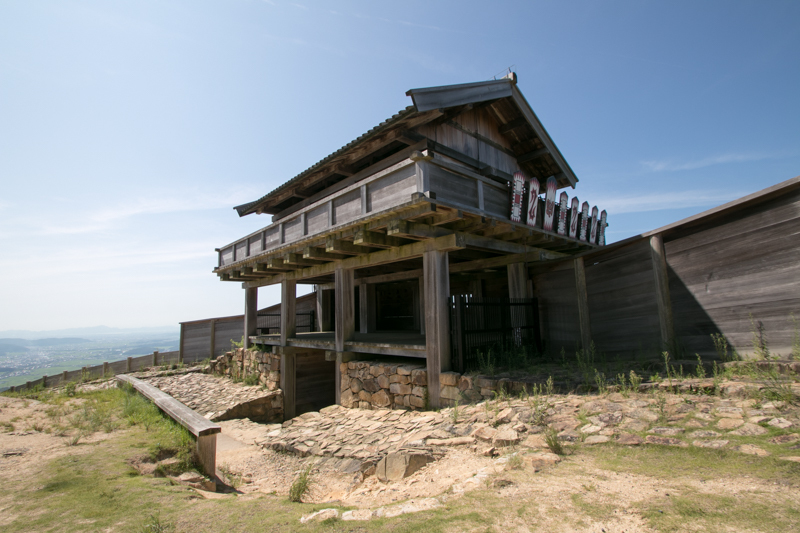 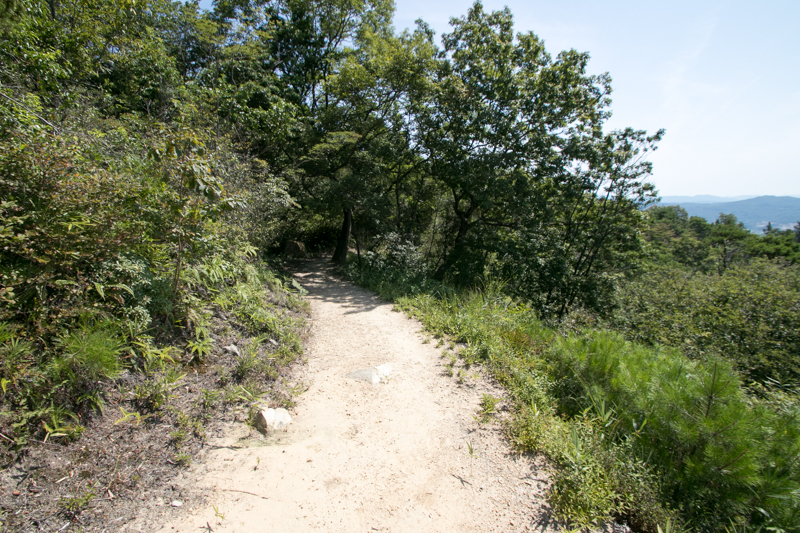 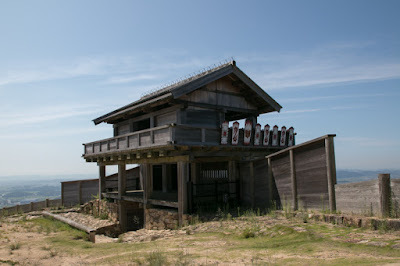 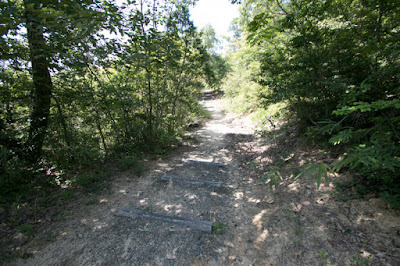 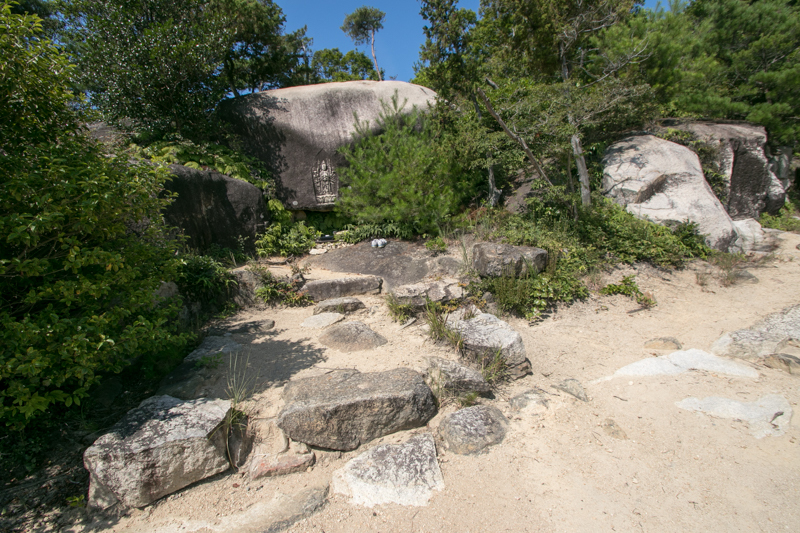 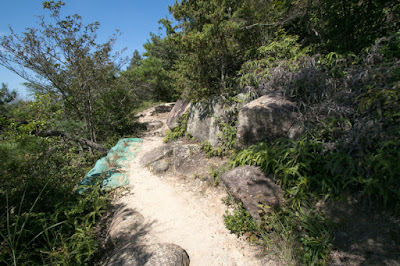 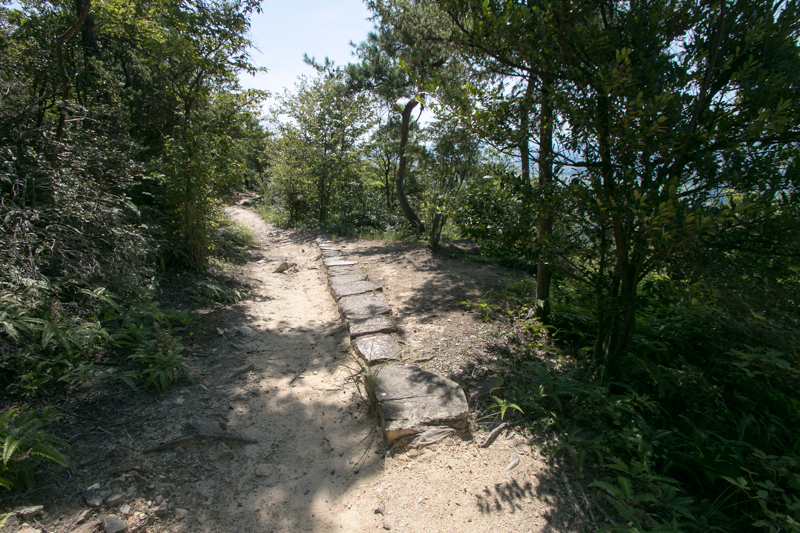 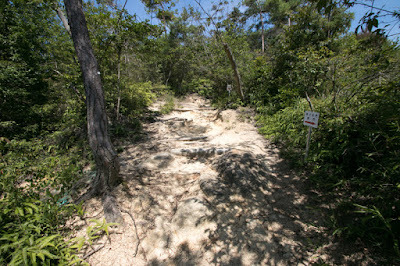 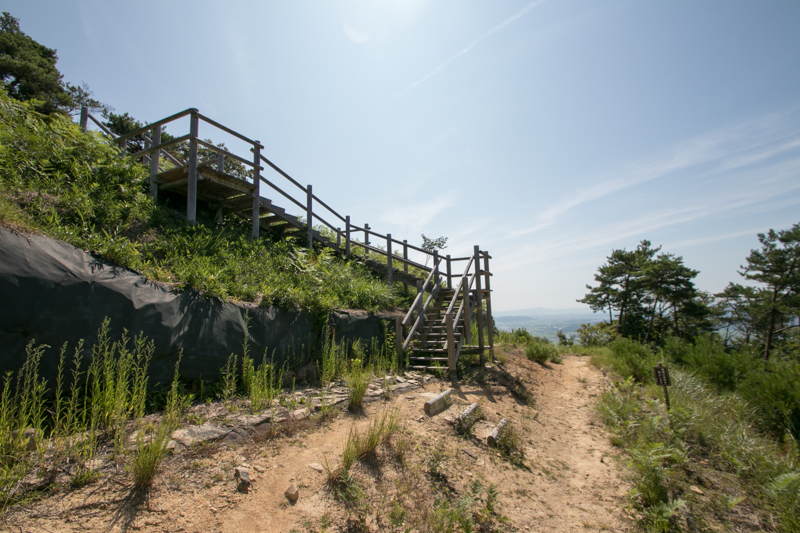 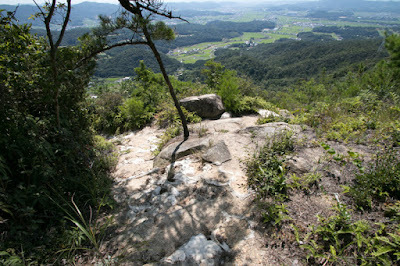 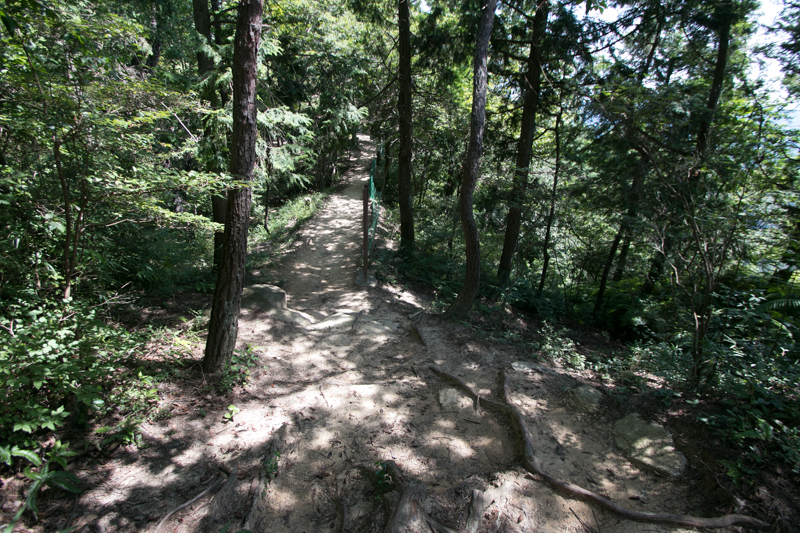 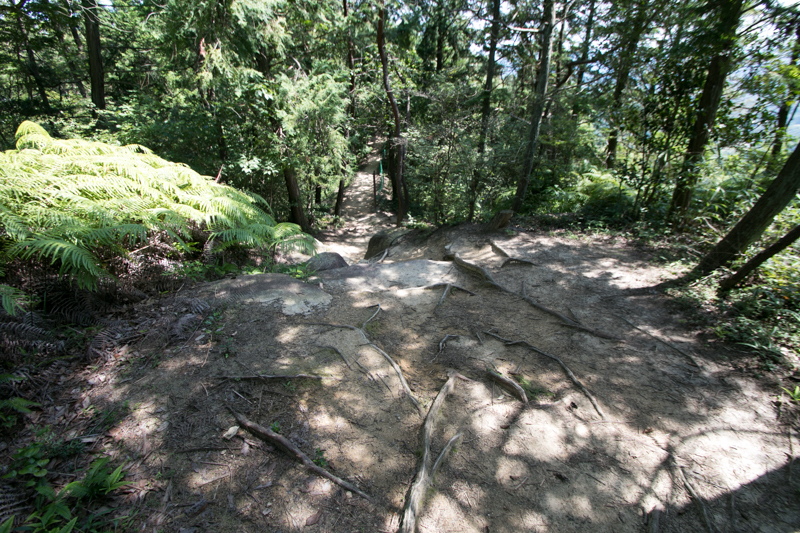 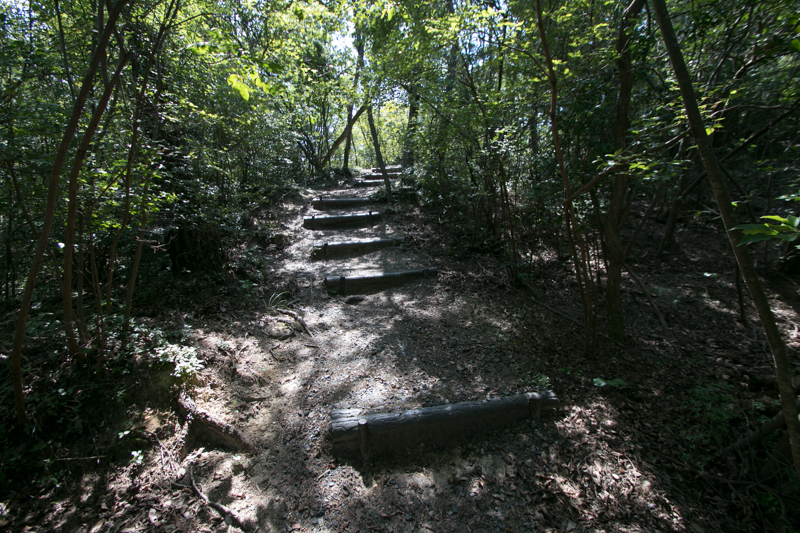 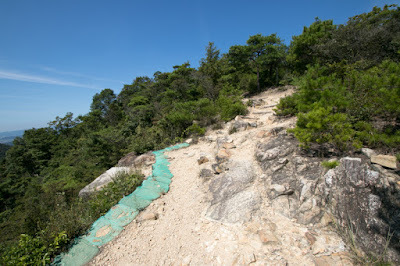 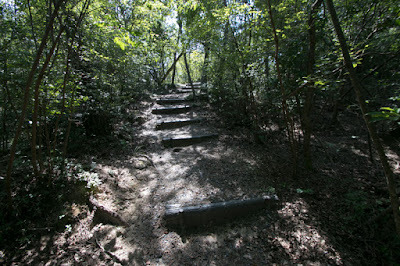 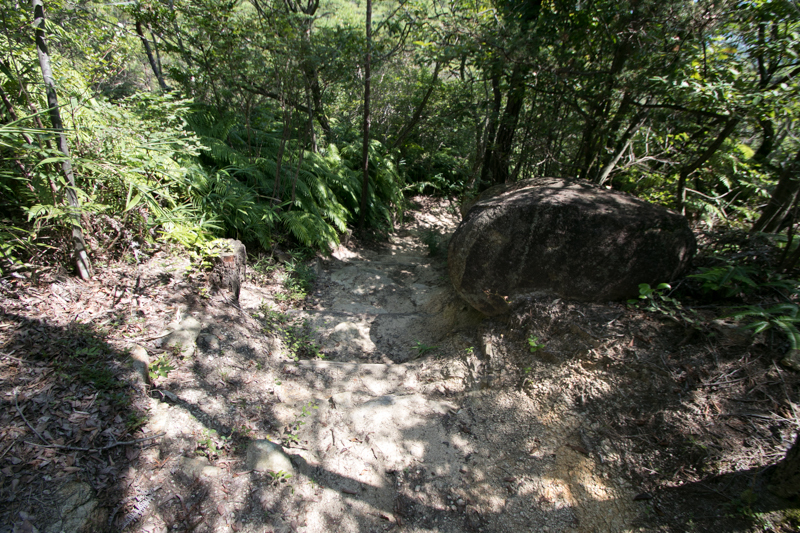 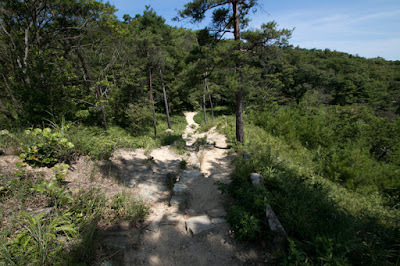 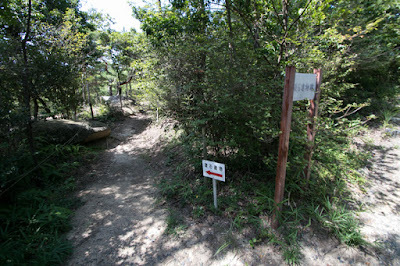 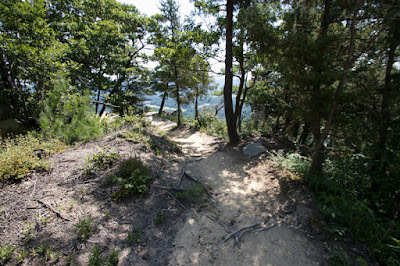 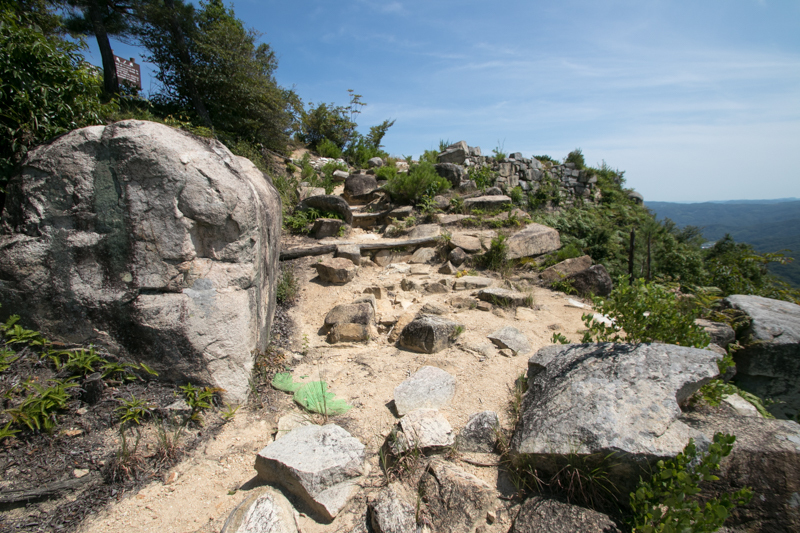 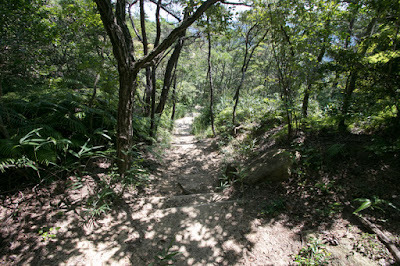 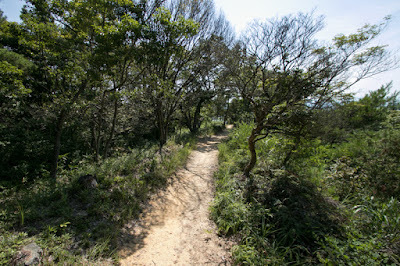 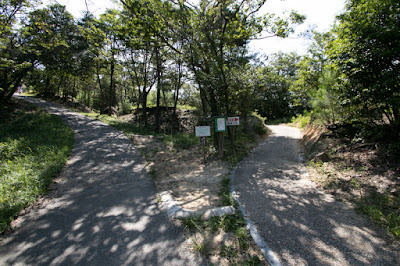 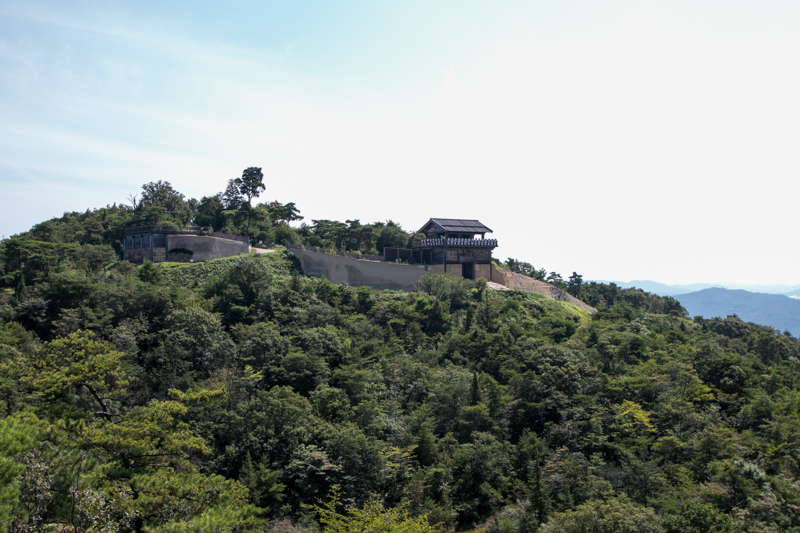 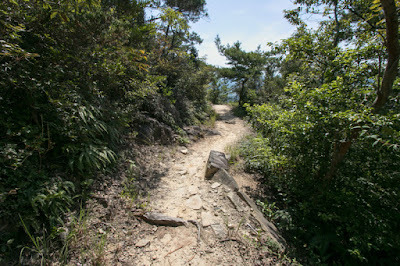 Kinojo castle (鬼ノ城) is located at the top of Kijyosan mountain, a one of 400 meter height with flat hilltop area. 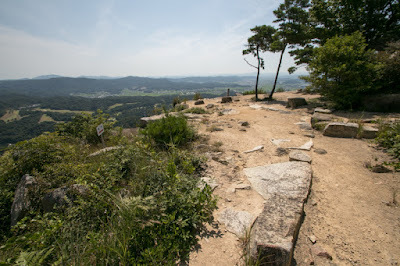 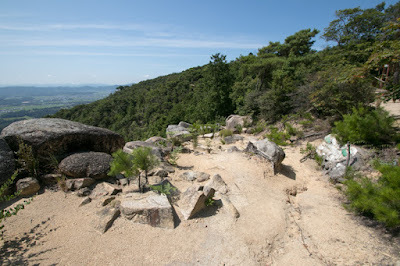 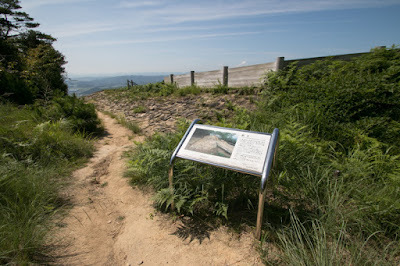 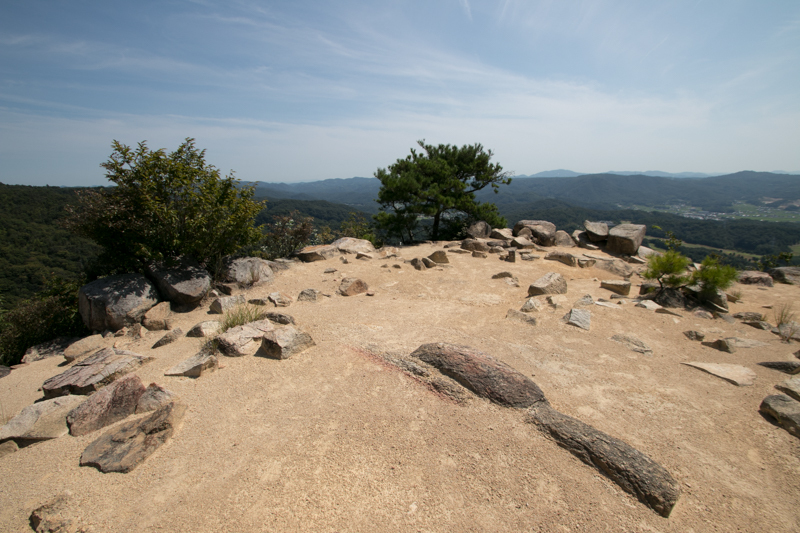 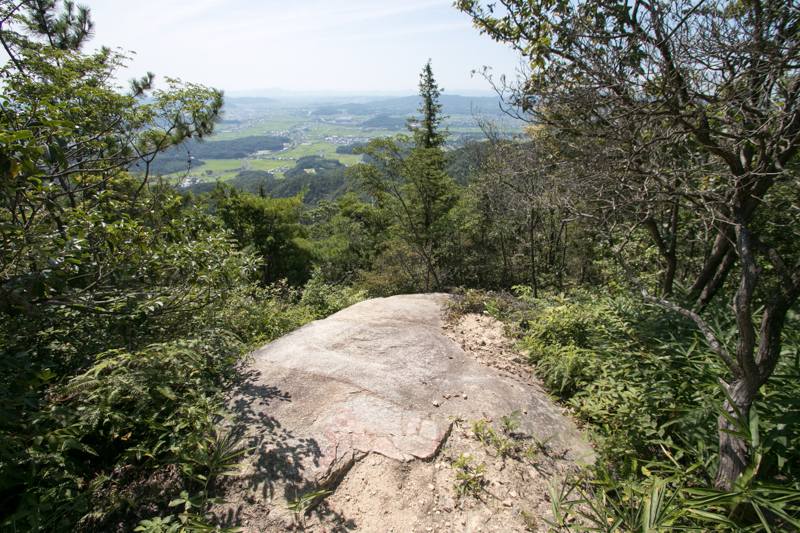 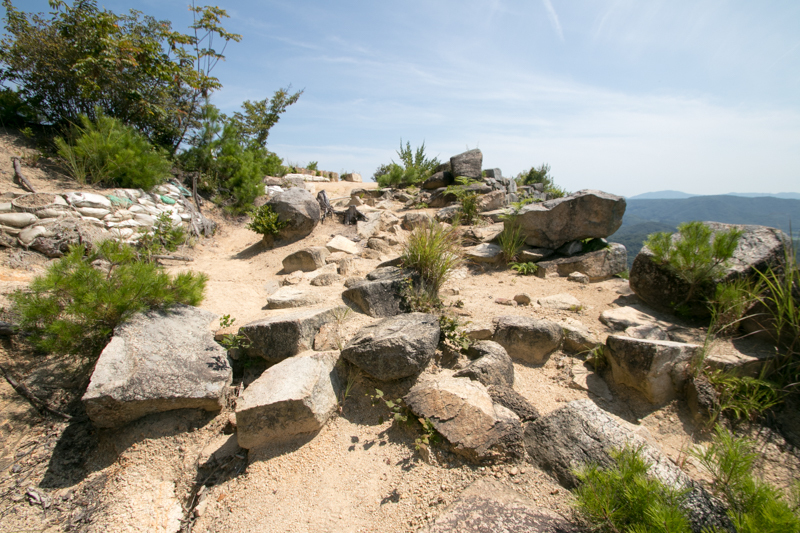 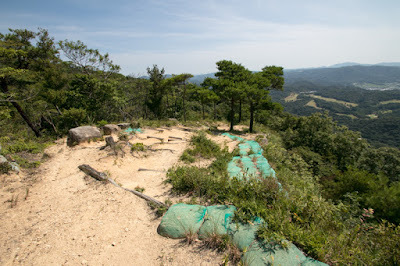 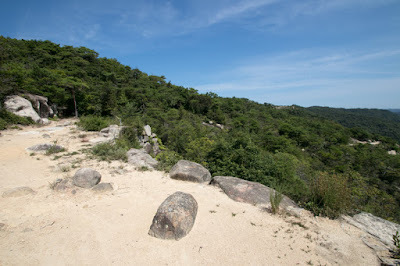 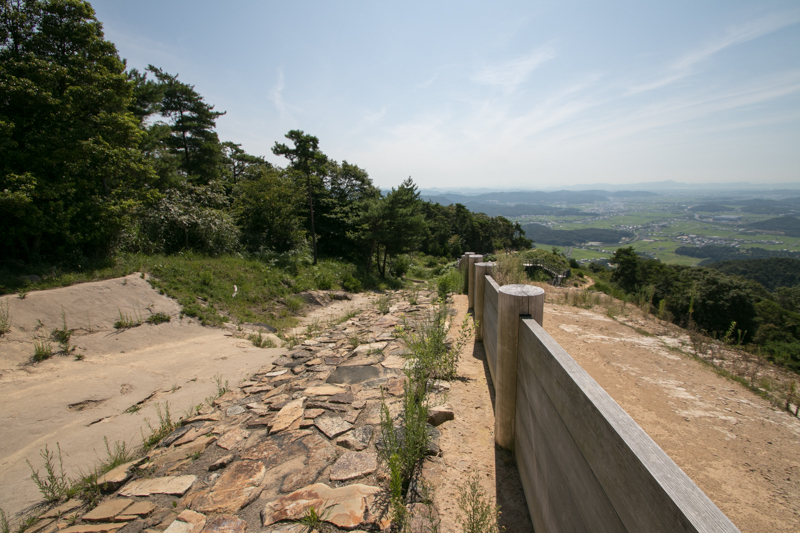 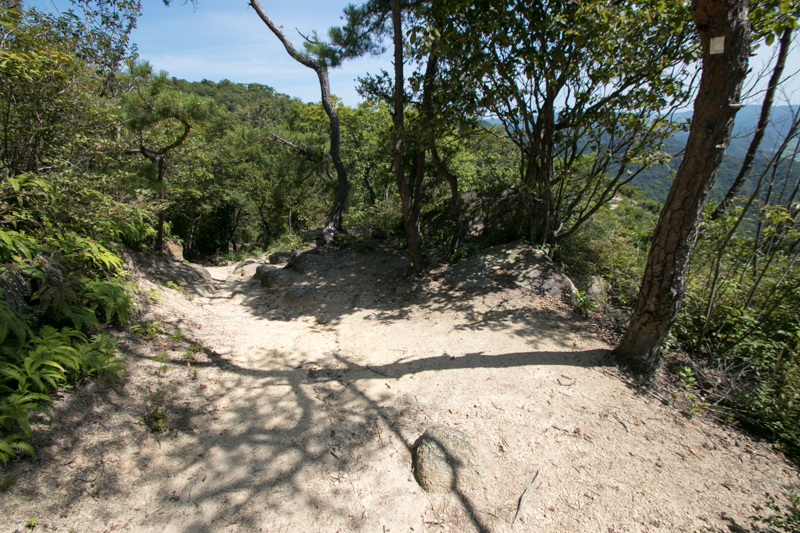 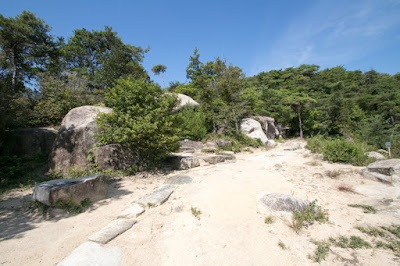 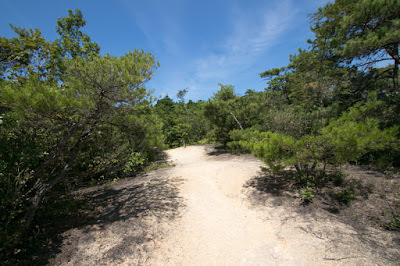 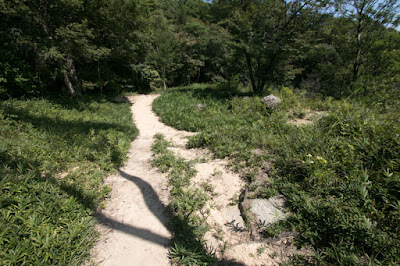 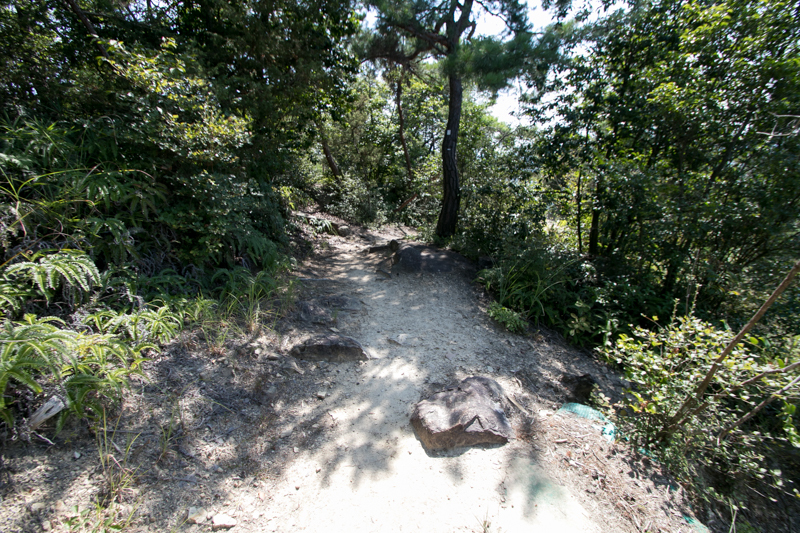 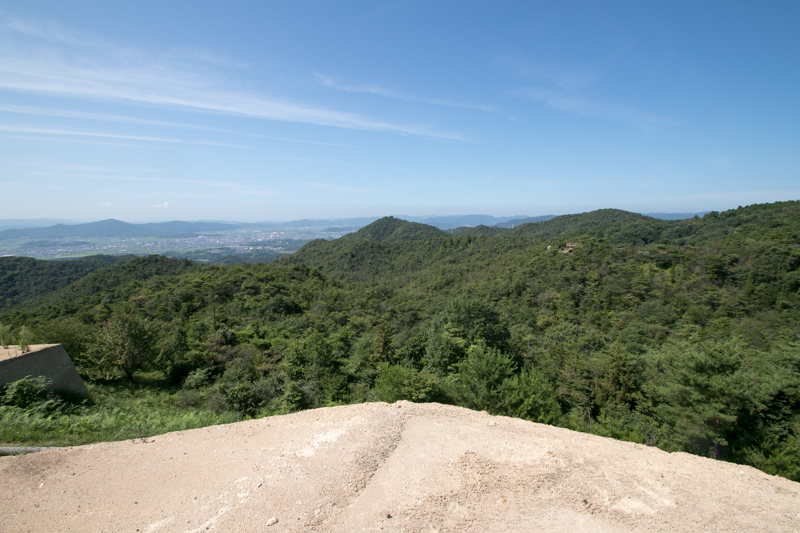 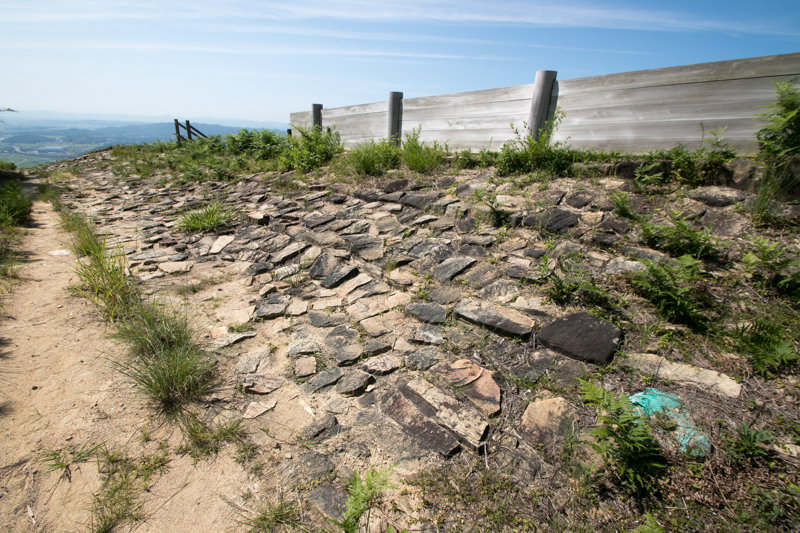 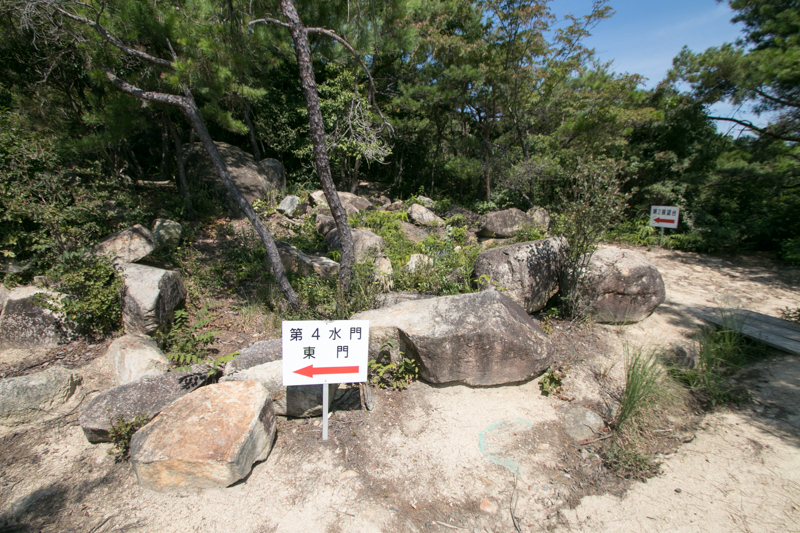 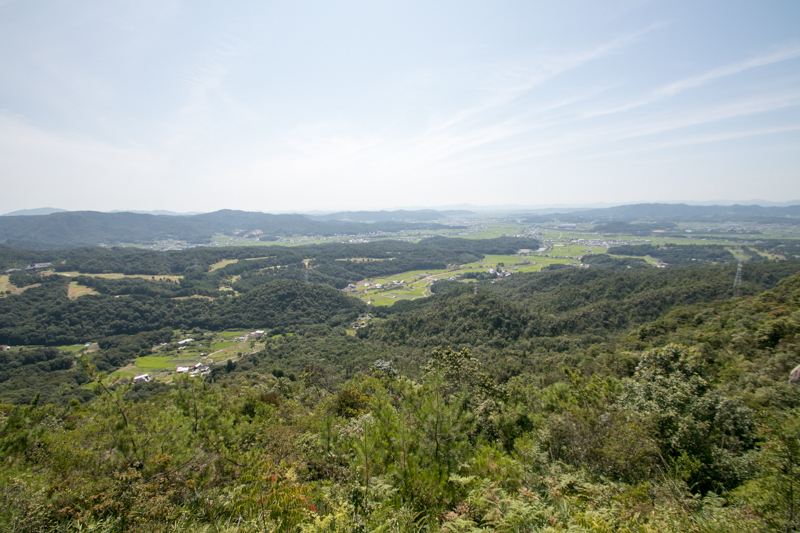 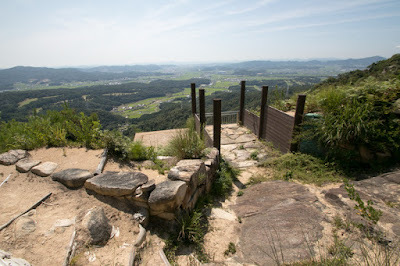 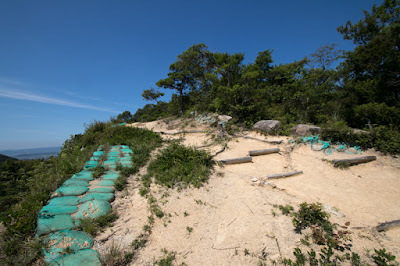 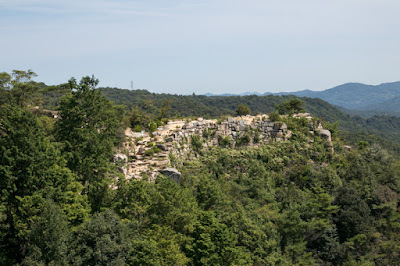 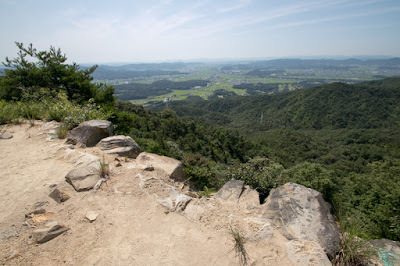 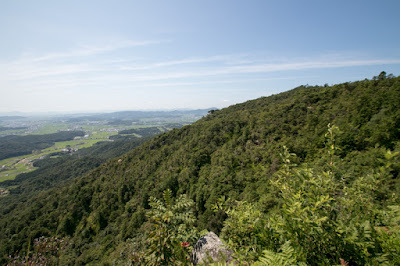 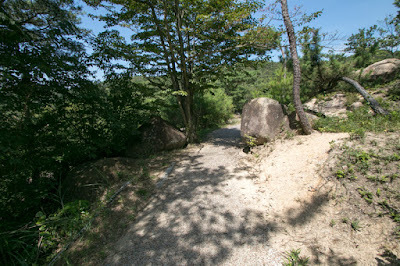 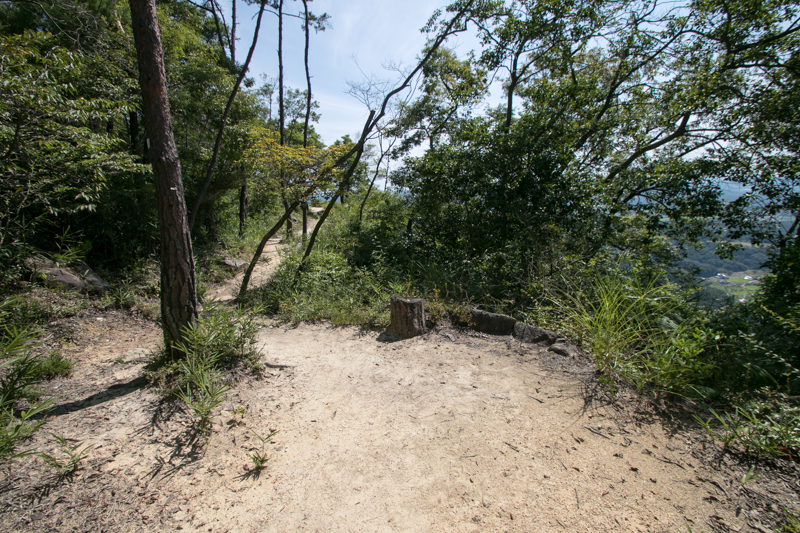 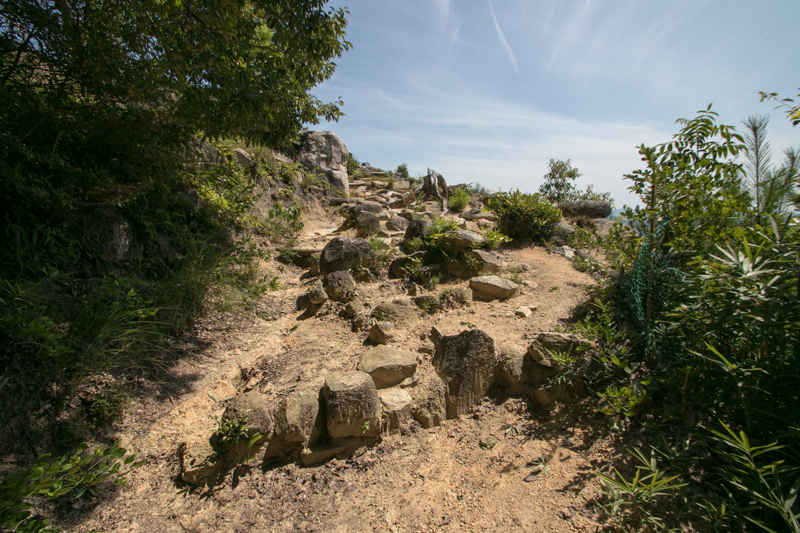 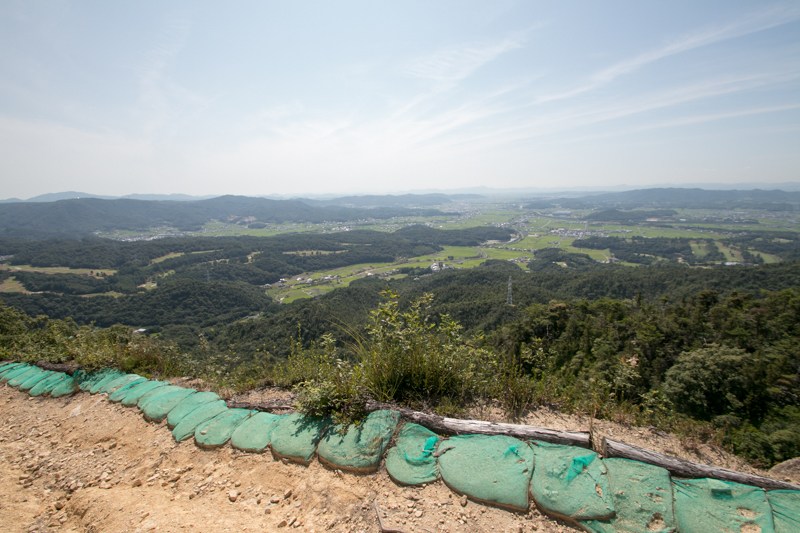 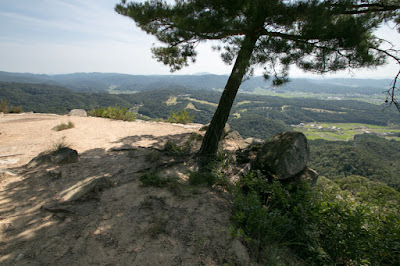 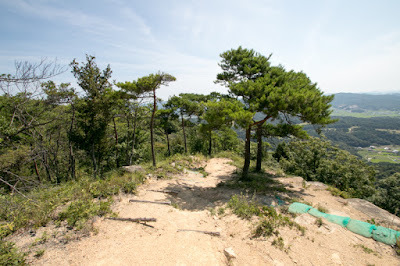 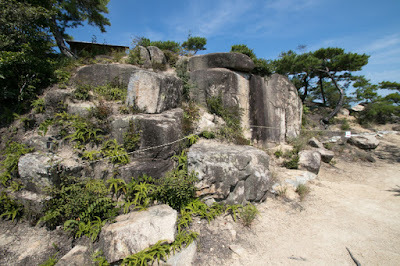 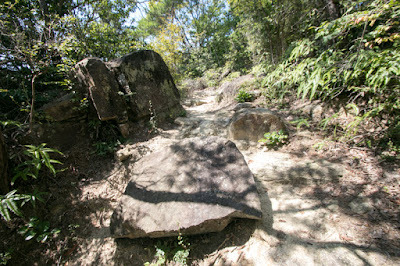 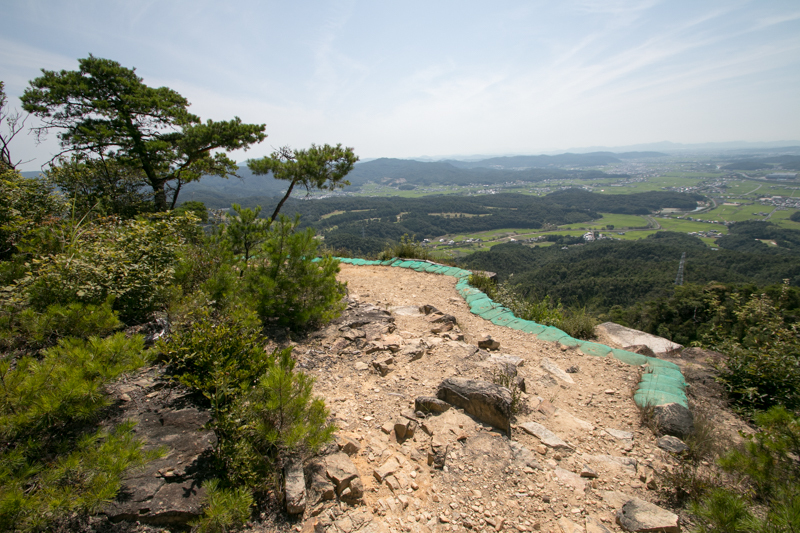 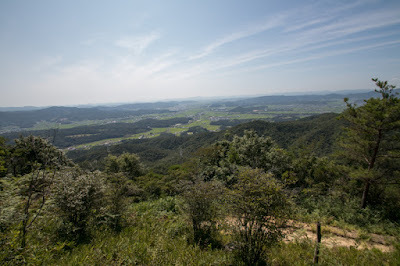 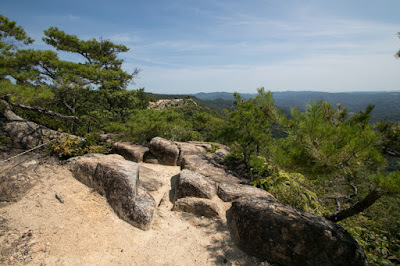 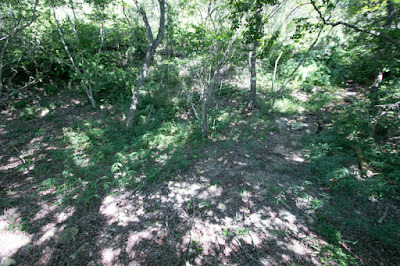 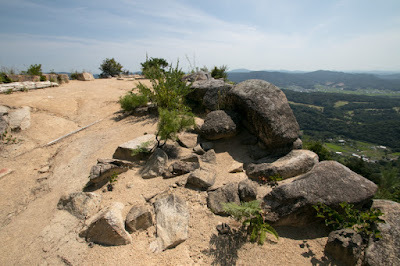 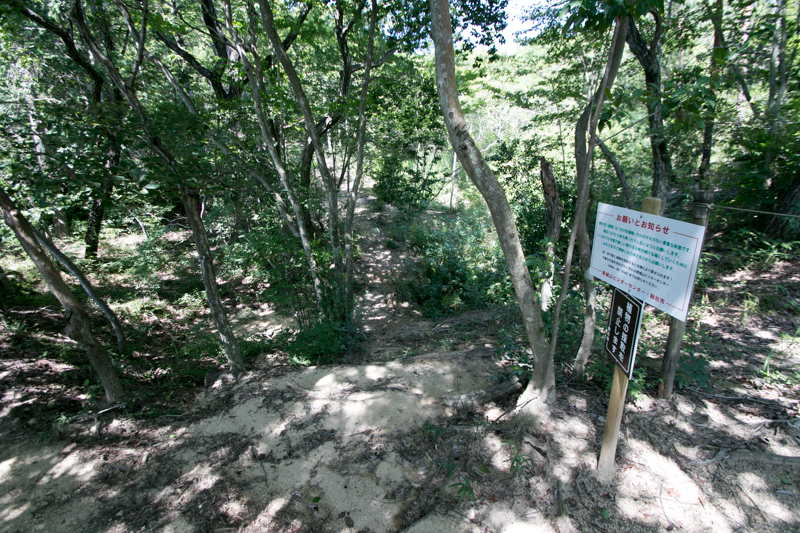 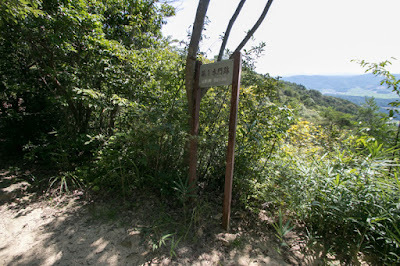 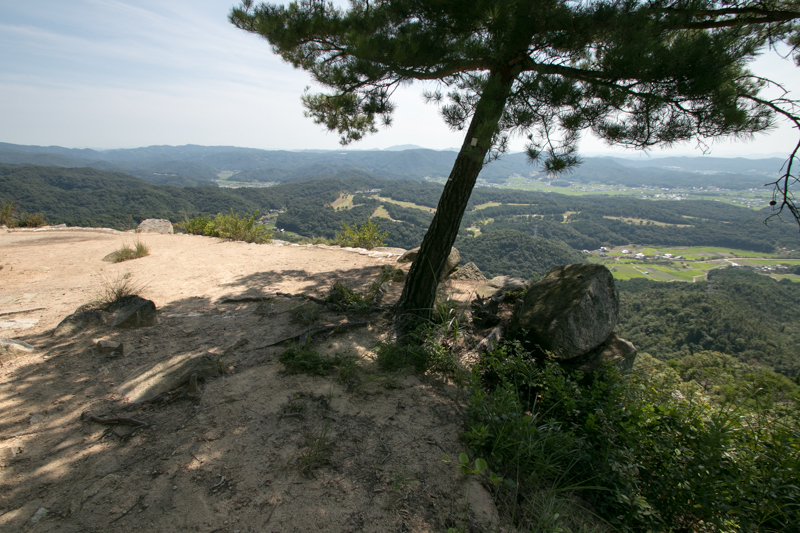 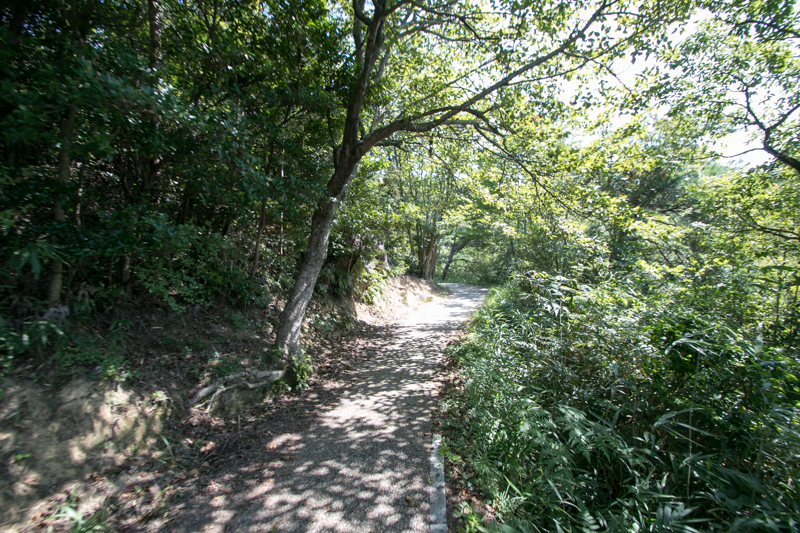 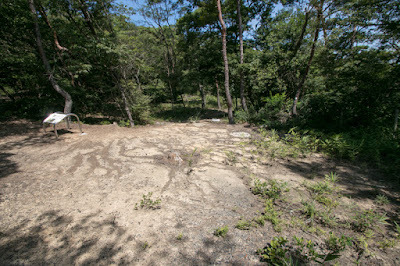 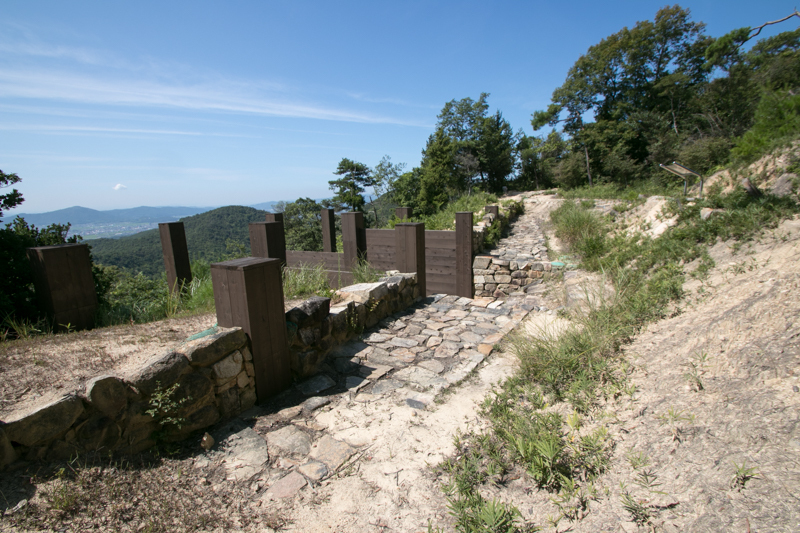 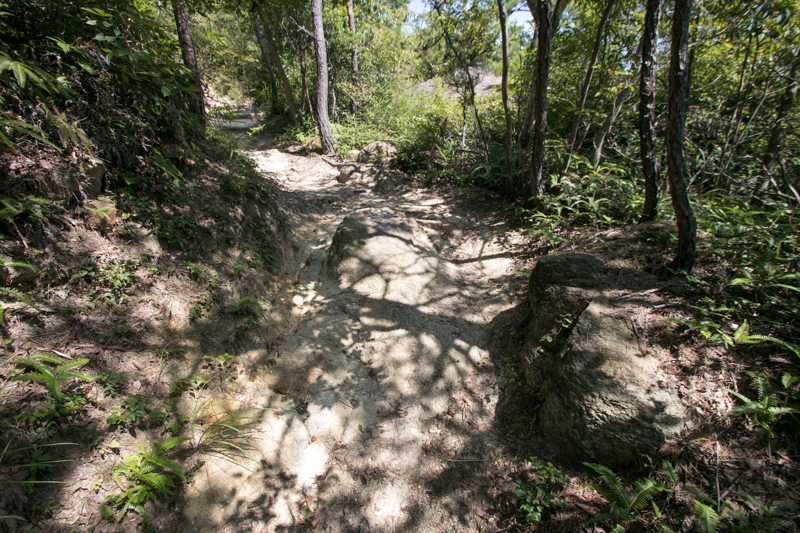 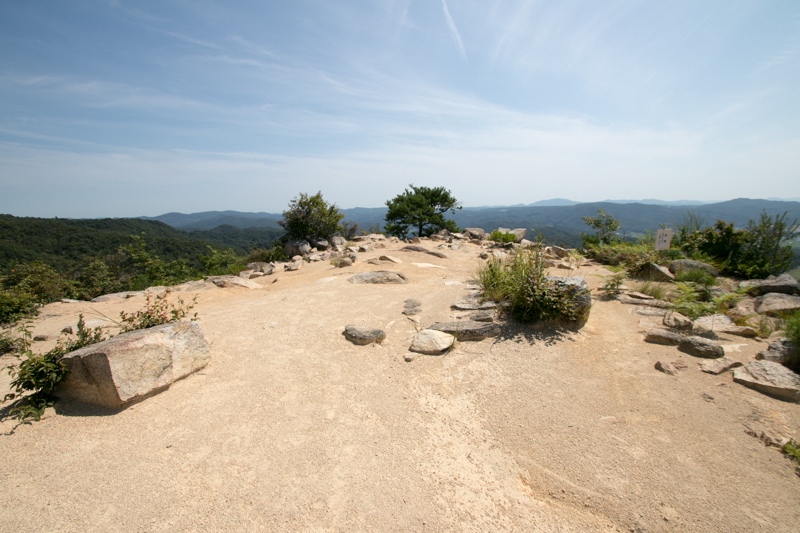 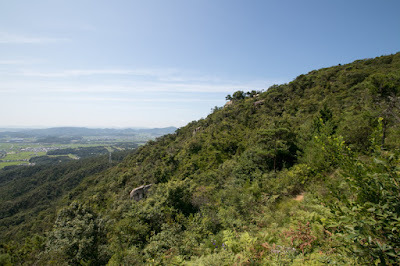 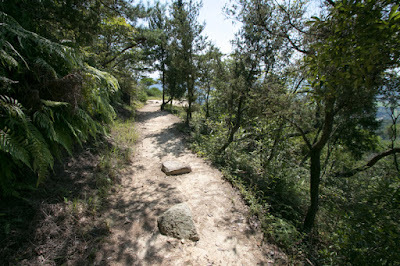 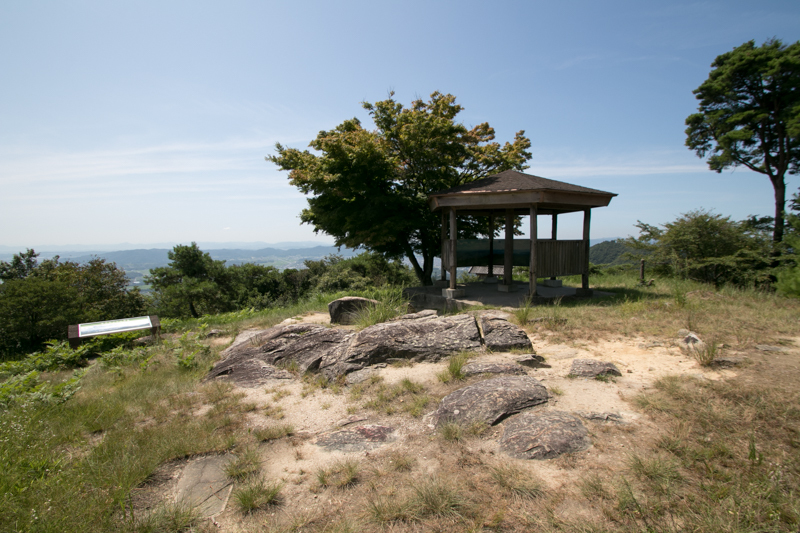 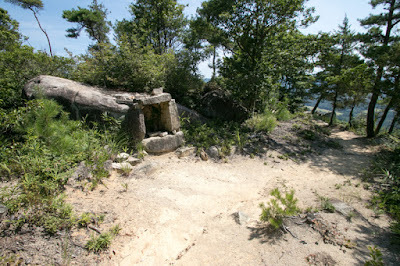 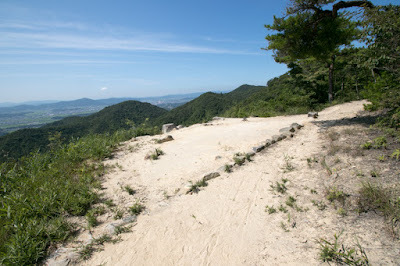 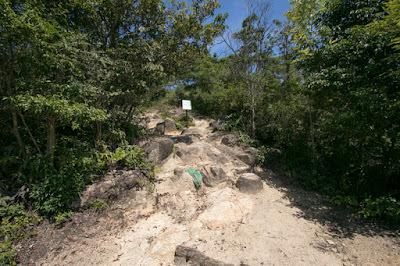 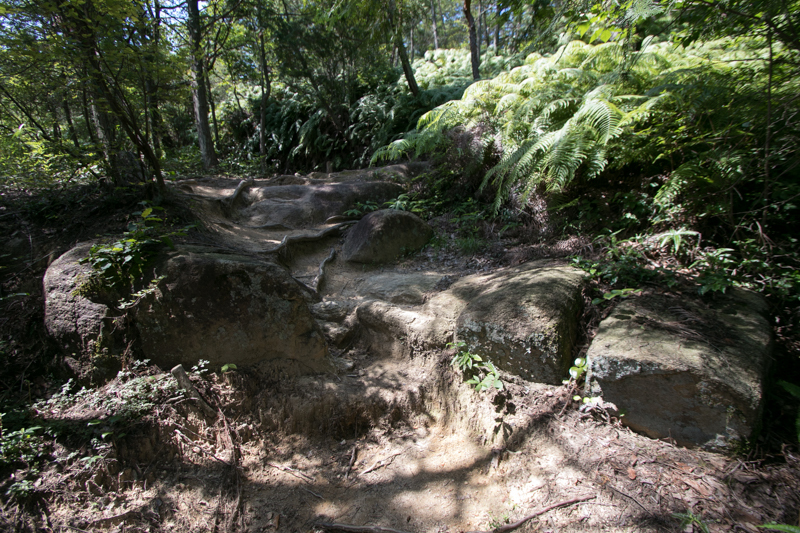 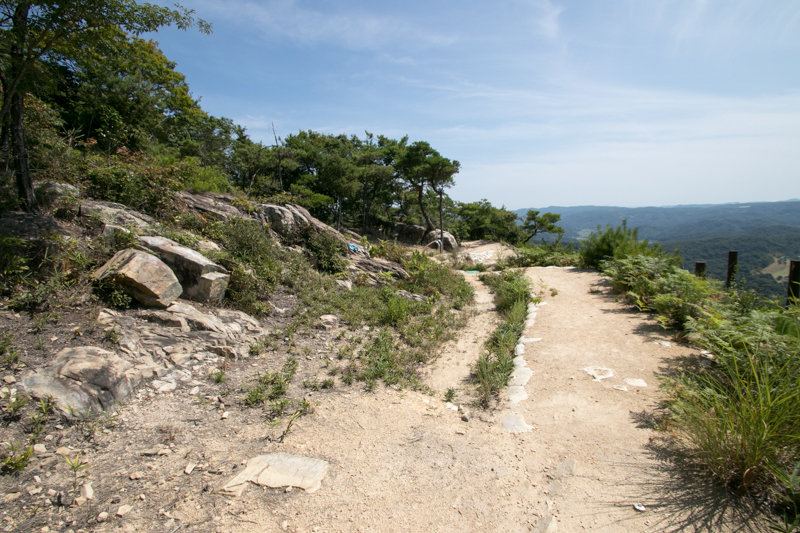 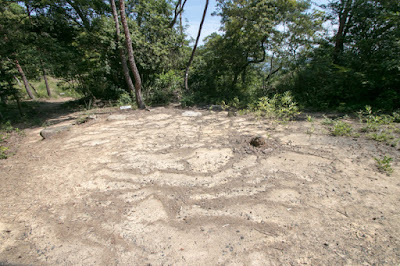 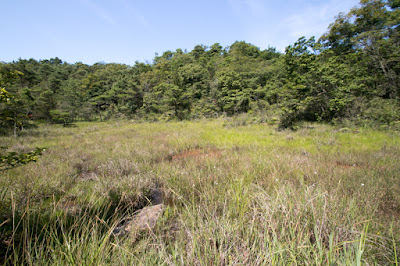 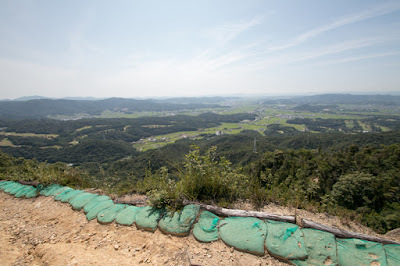 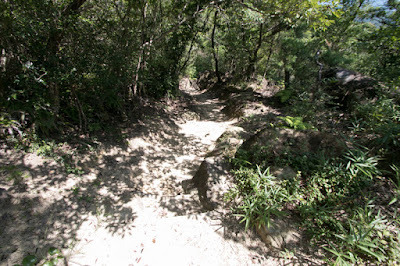 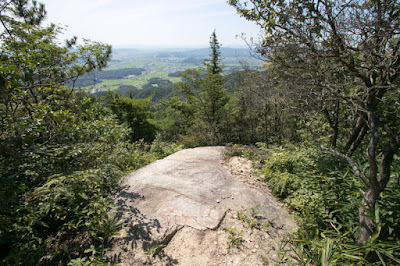 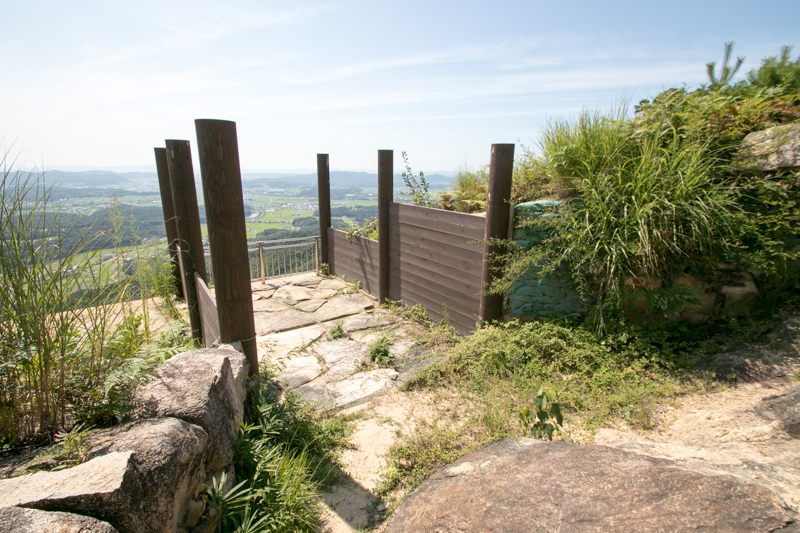 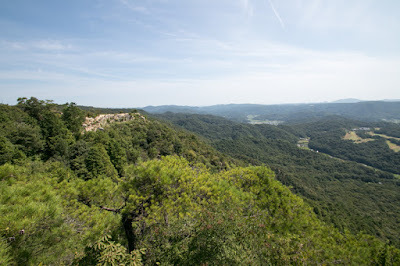 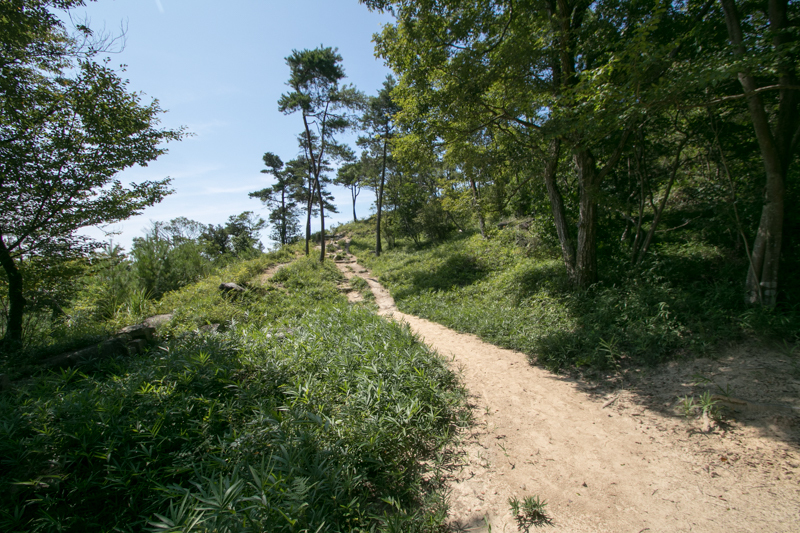 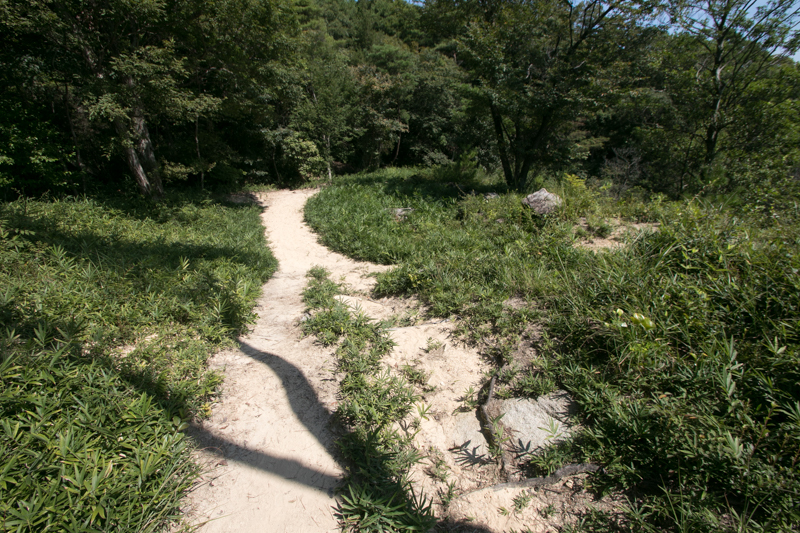 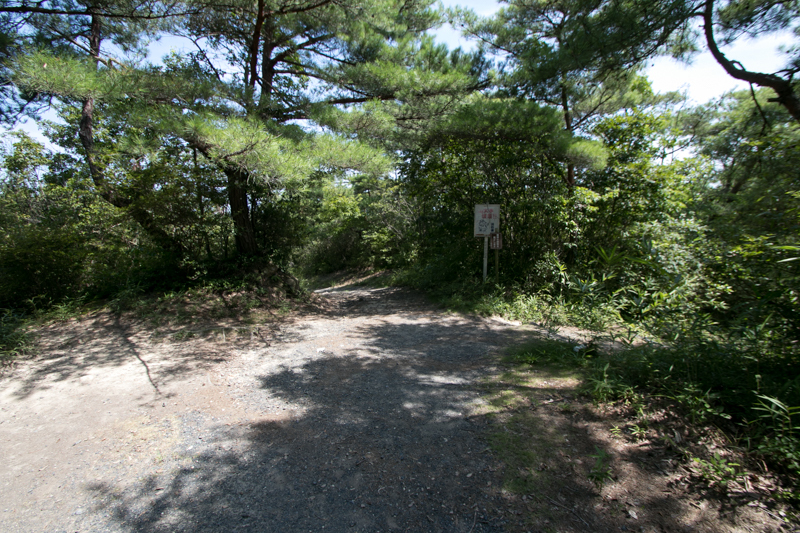 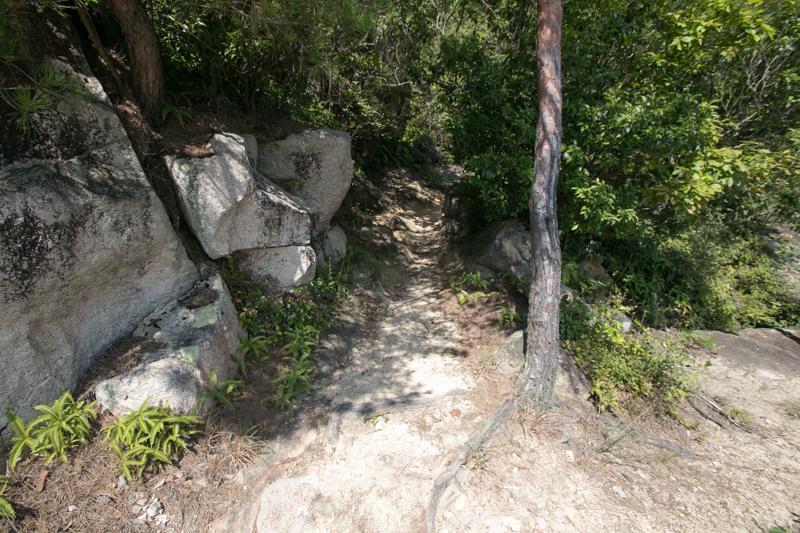 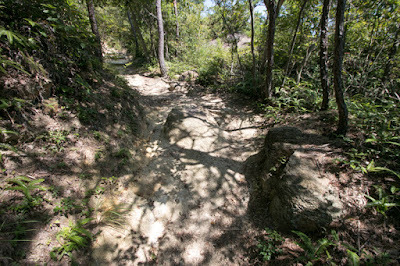 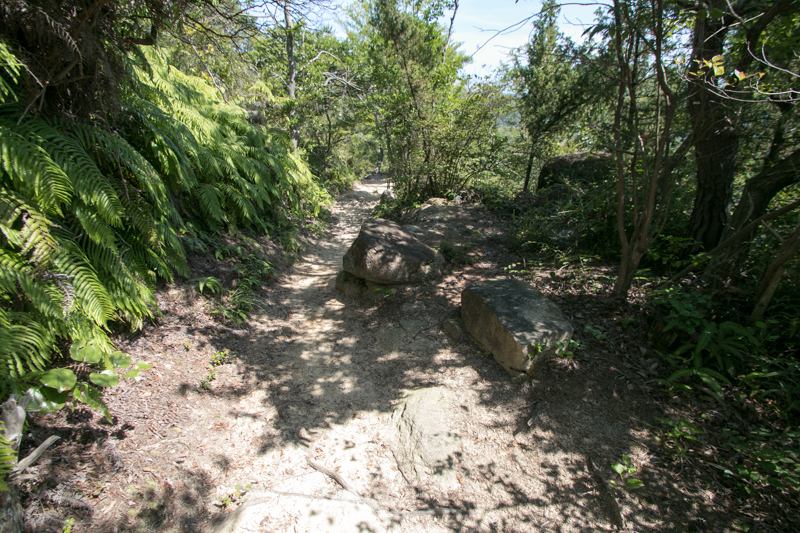 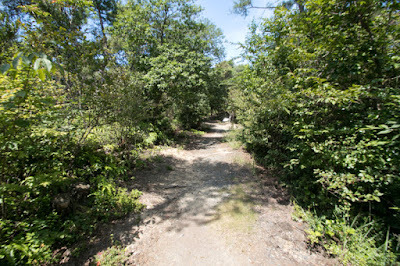 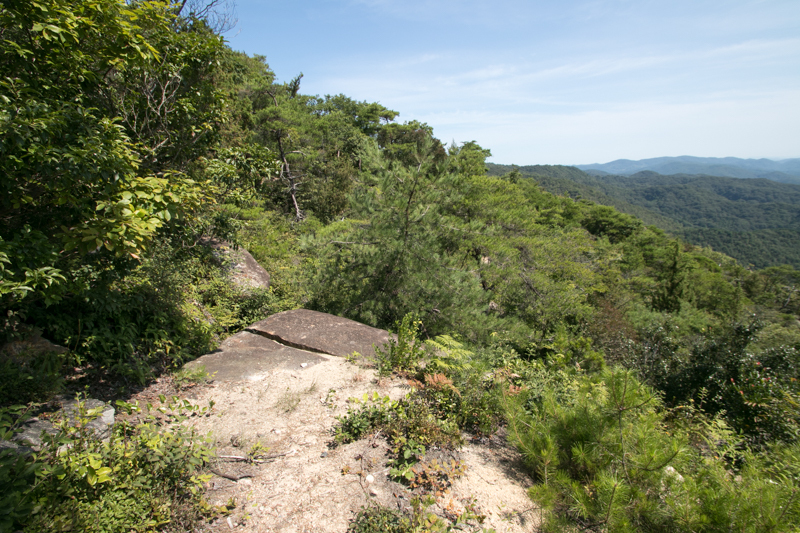 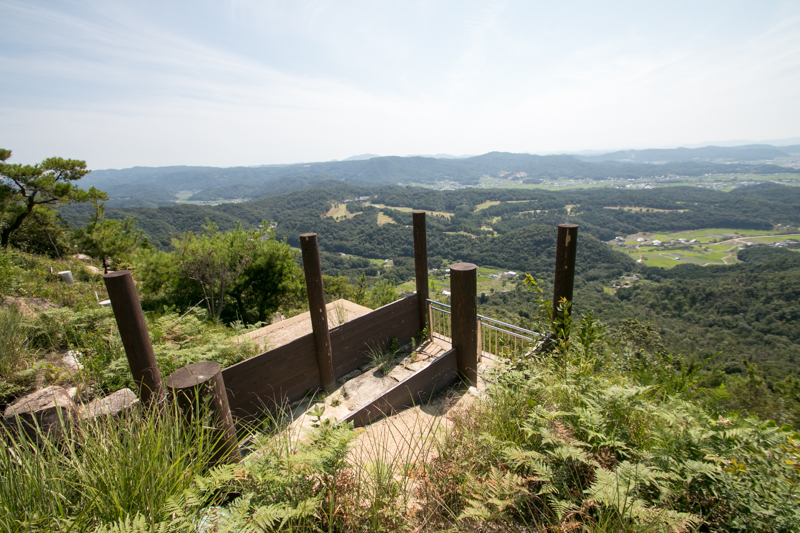 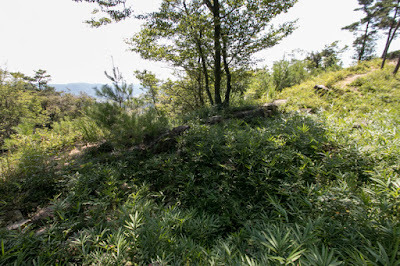 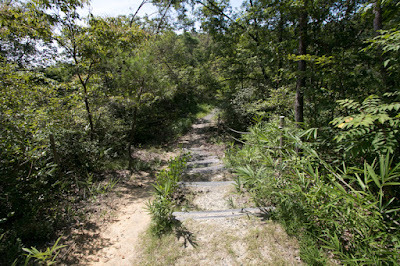 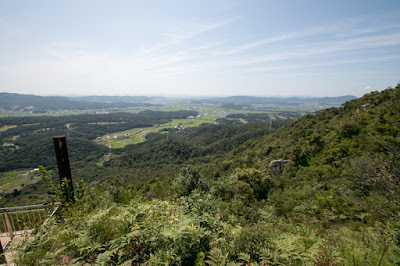 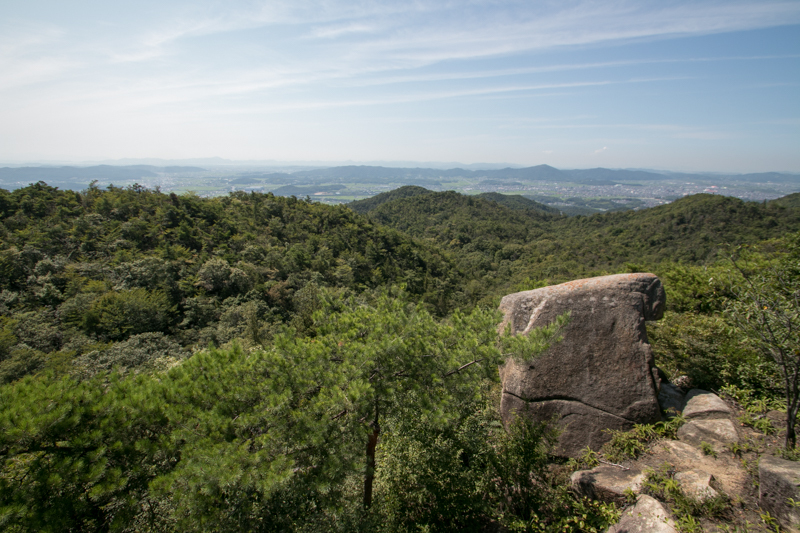 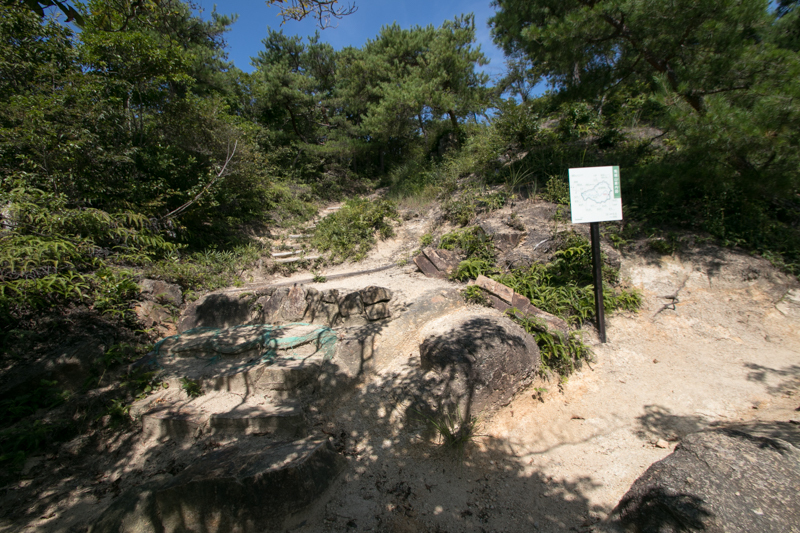 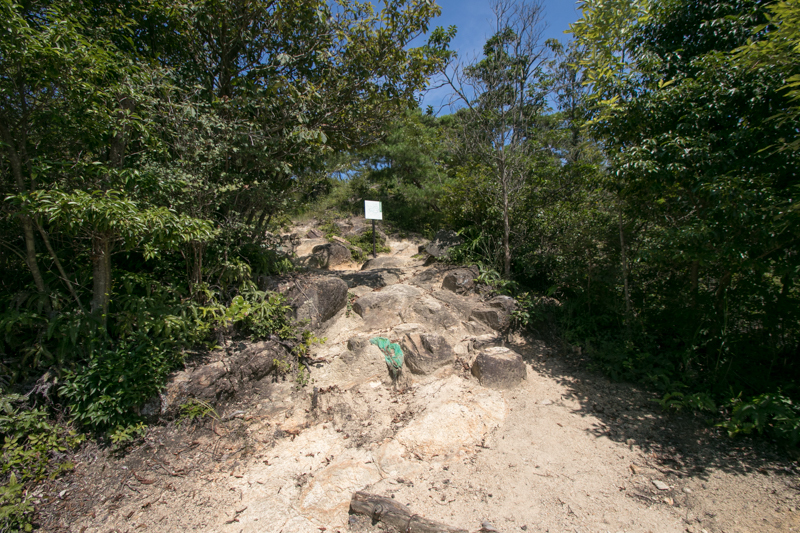 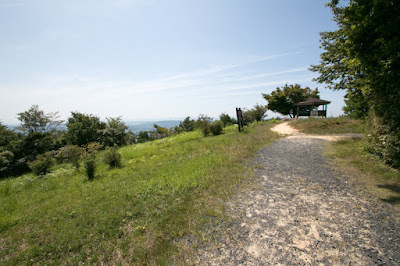 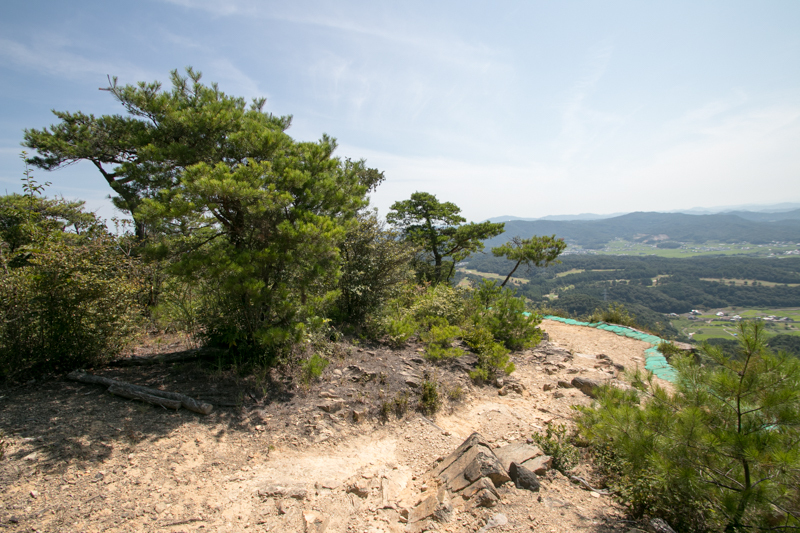 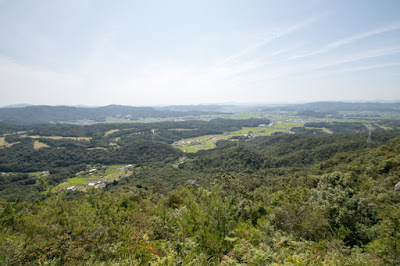 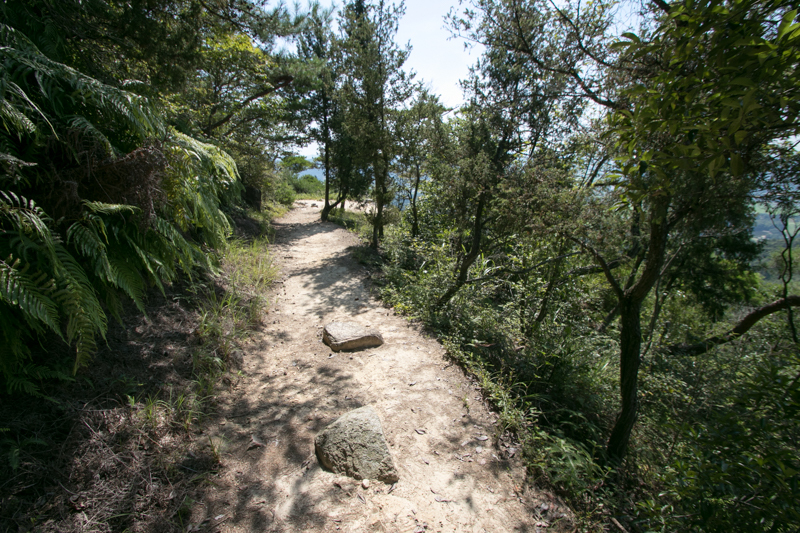 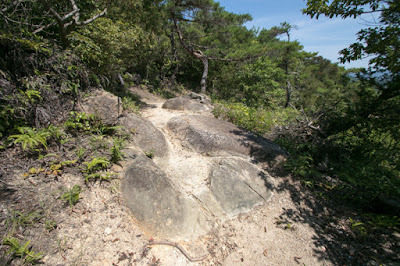 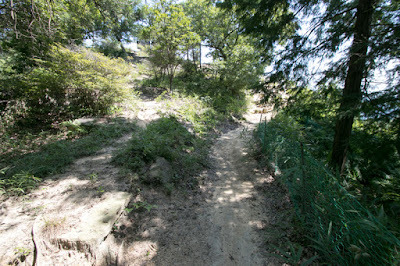 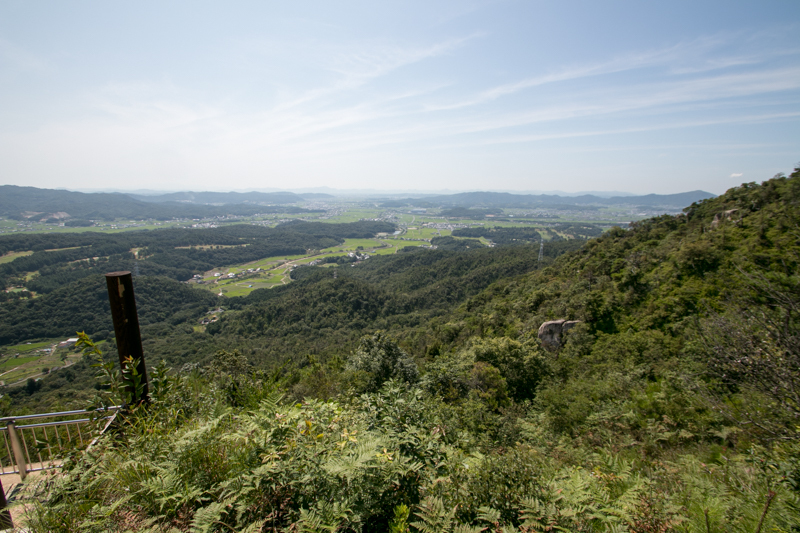 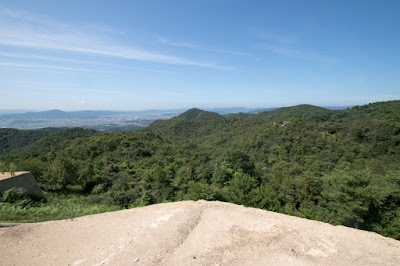 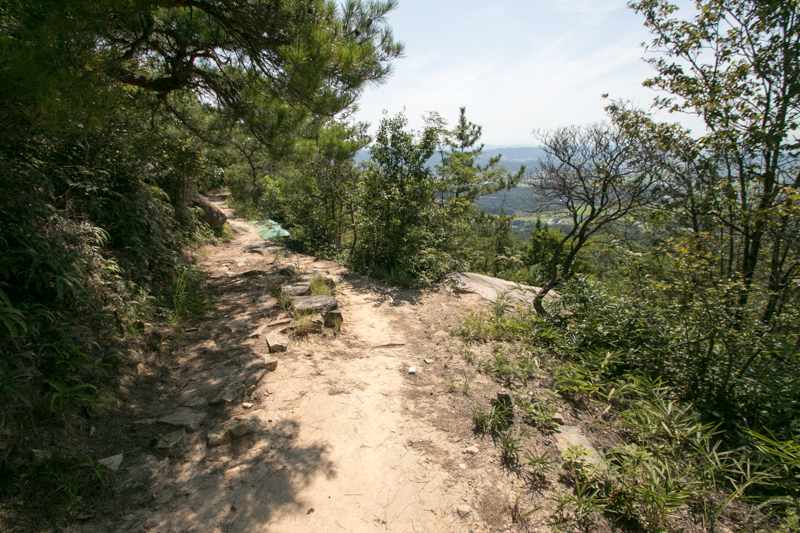 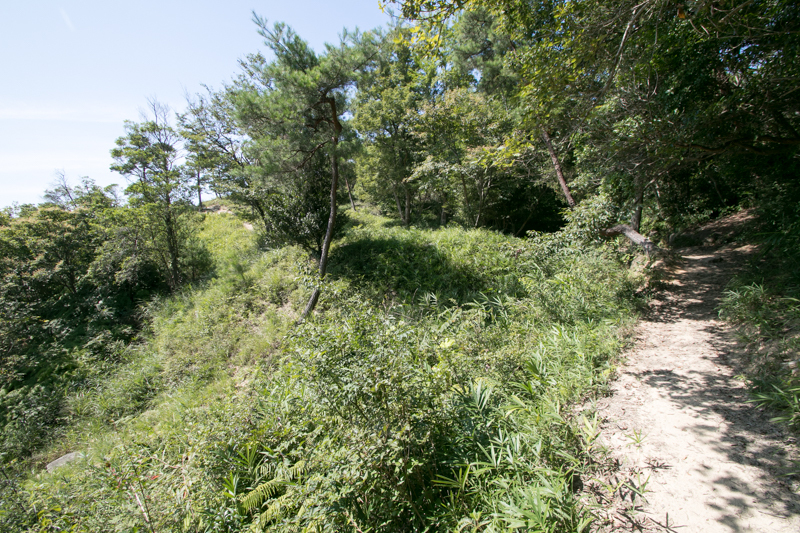 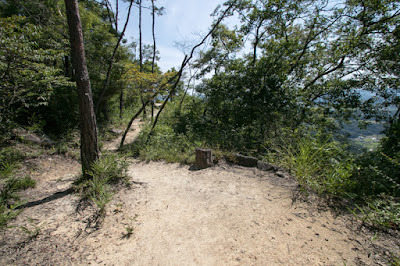 Kijyosan mountain is the south edge of Kibi height spread at the middle of Okayama prefecture, and the plain spread at the south of the castle was the center of ancient Kibi kingdom in 4th and 5th century. 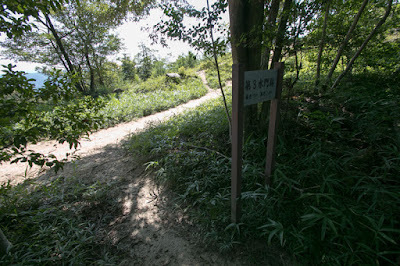 Throughout medieval and modern era before 19th century, except for government delegation and private trade, Japan had not been involved in political situation in east Asian area so much other than some exception such as invasion of Chinese Yuan in 13th century. 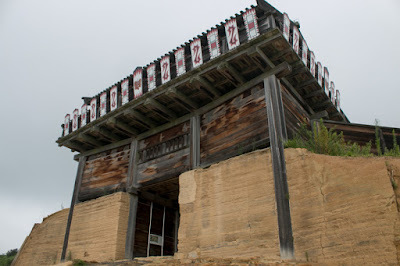 But prior to 8th century, among the rapid change of political situation of East Asian region, Yamato dynasty of ancient Japan had been one player of this political situation. During sixth and seventh century, at the era of three kingdom (Goguryeo, Baekje and Silla) of Korean peninsula, Japan originally had relationship with Baekje kingdom. 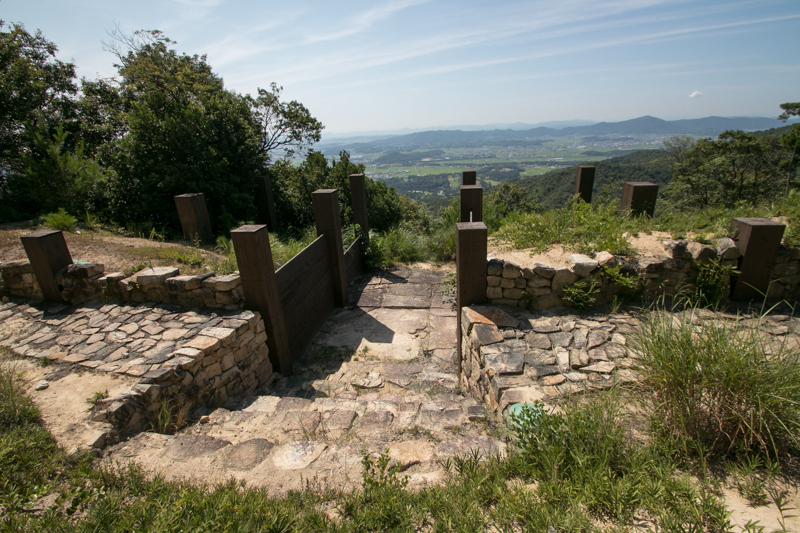 But in 660, Baekje kingdom was extinguished by alliance of Chinese Tang dynasty and Silla kingdom, and royal family of Baekje kingdom escaped to Japan. Facing such situation, in 661, Emperor Seimei (596-661) and Prince Nakanooe (626-672, later Emperor Tenchi) sent a large army to Korean peninsula, to support restoration of Baekje kingdom. 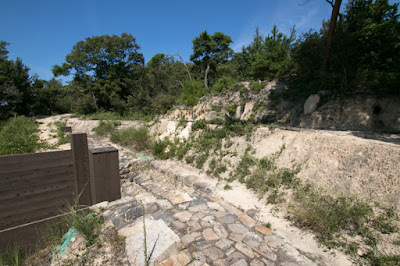 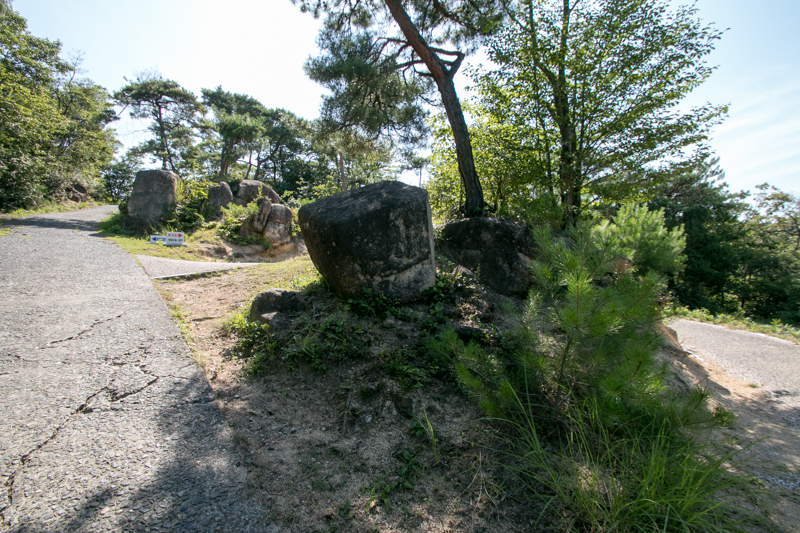 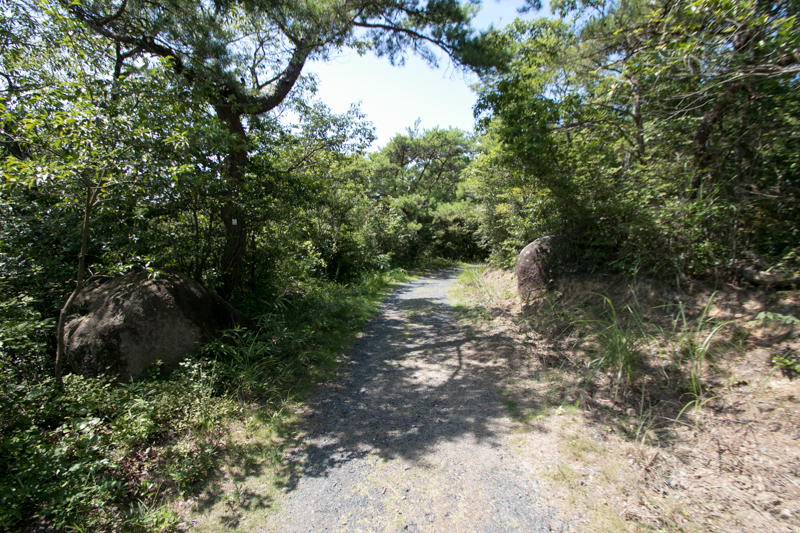 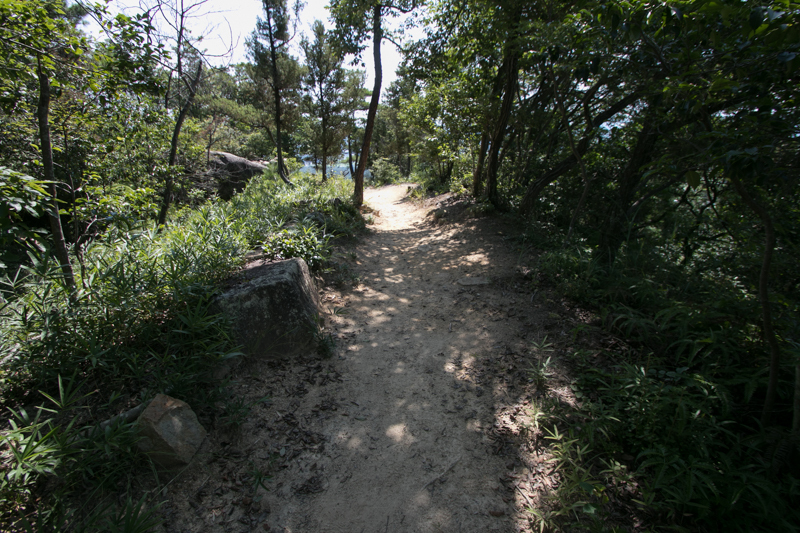 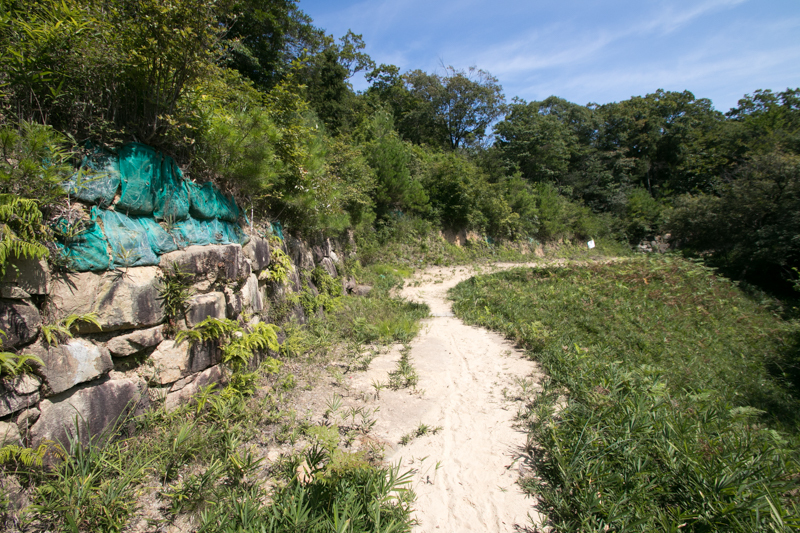 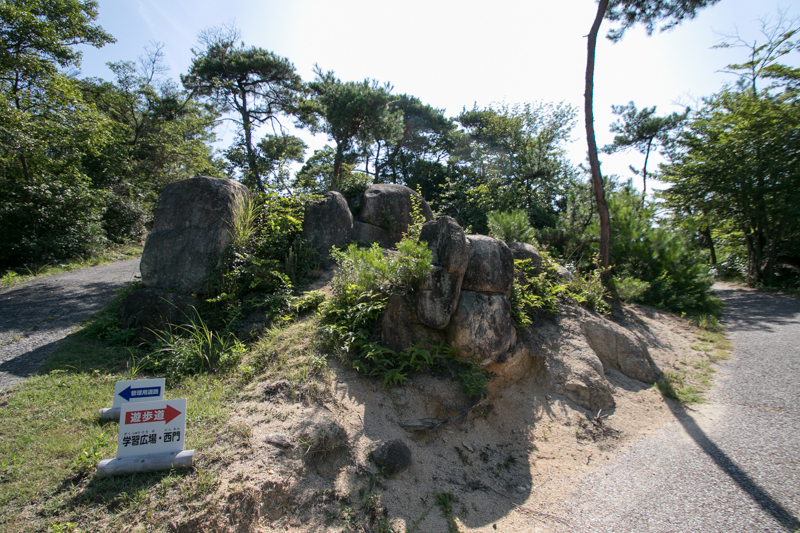 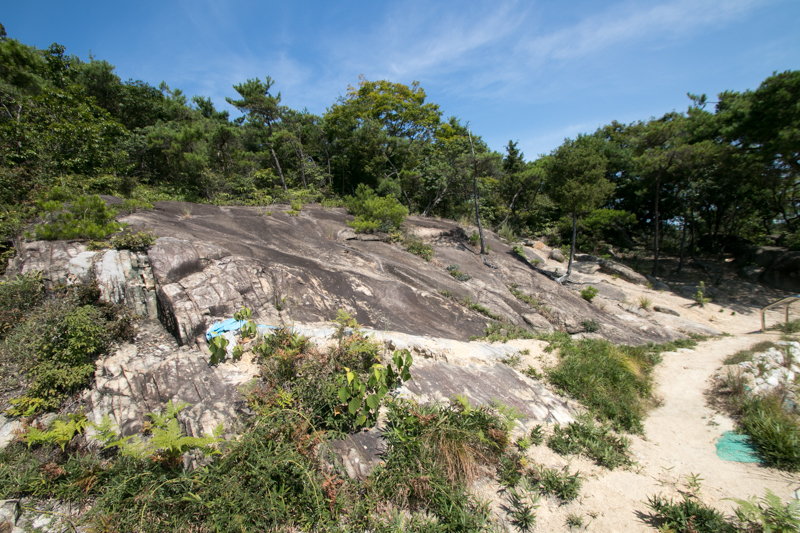 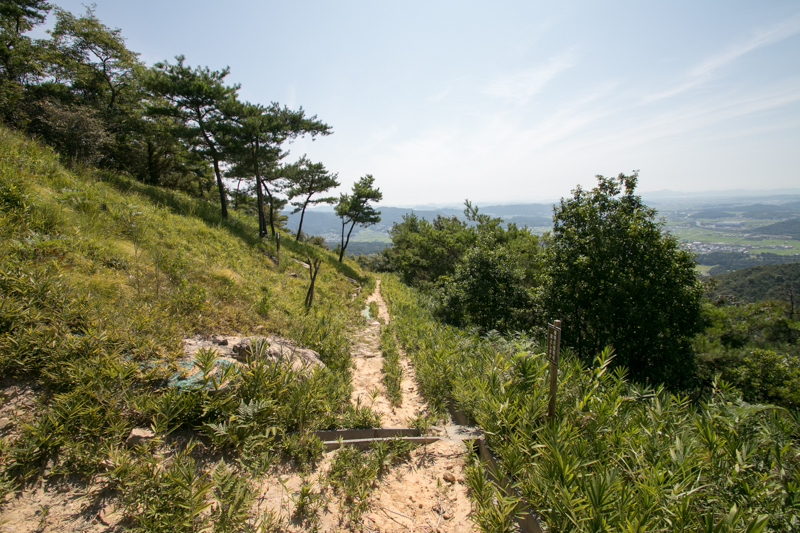 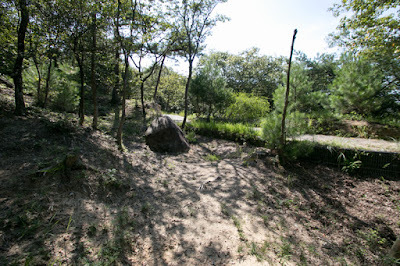 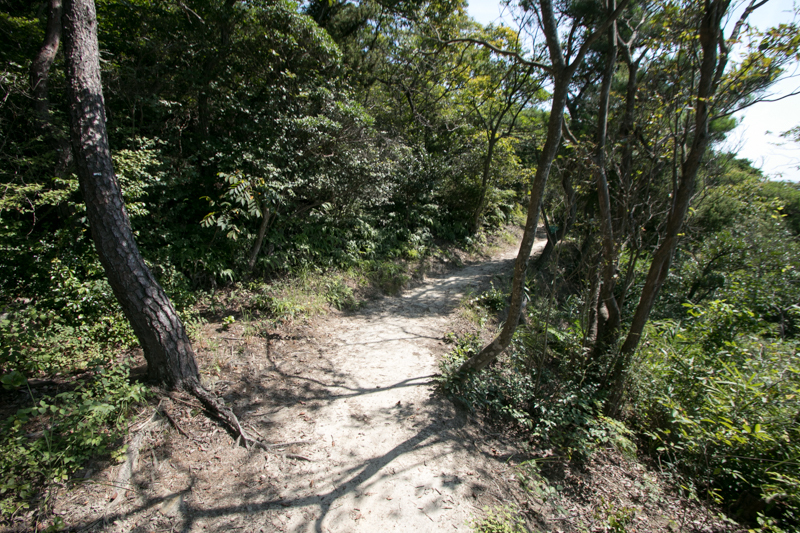 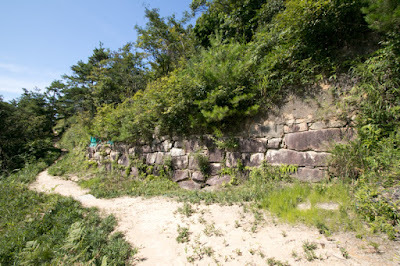 Alliance of Baekje army and Yamato dynasty once restored south edge of Korean peninsula, but in 663 they suffered fatal defeat by the alliance of Tang dynasty and Silla Kingdom at Hakusonko sea (river mouth of Kungan river near Gunsan city) and neighbor land. 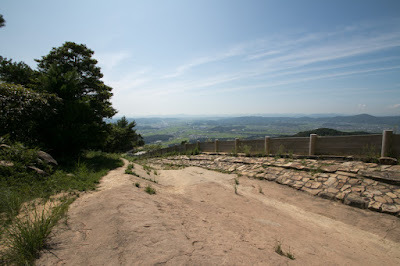 Japan had to abandon their attempt of restoration of Baekje kingdom, and further had to prepare for the revenge of Tang dynasty and Silla dynasty. After the defeat at Hakusonko sea, Prince Nakanooe became the Emperor Tenchi and started centralization of nation to strengthen national security. 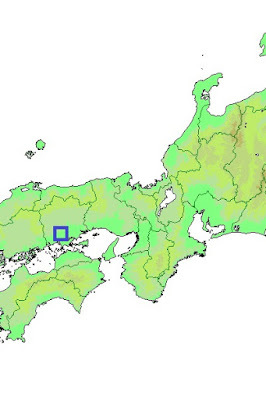 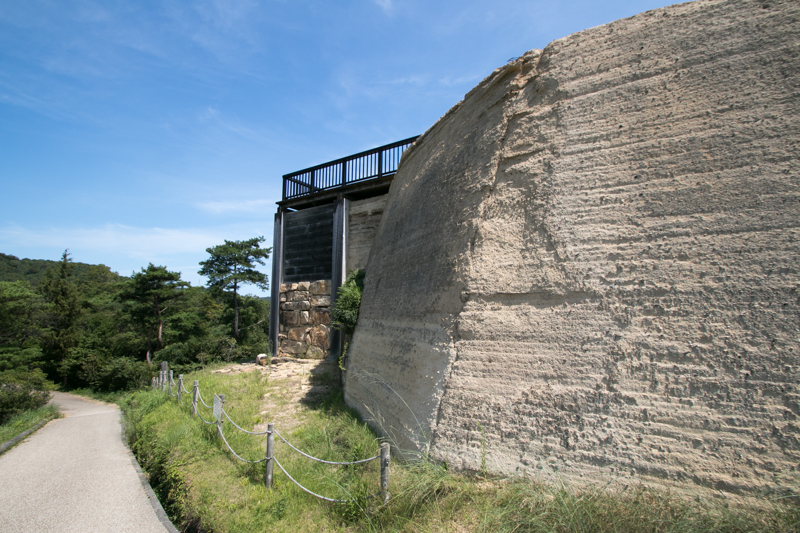 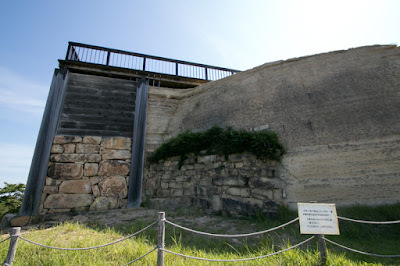 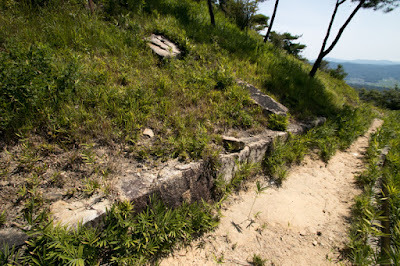 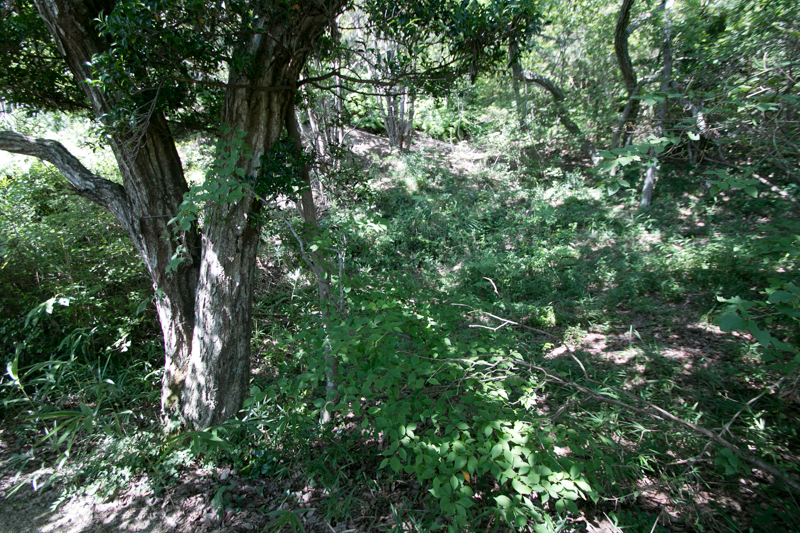 According to Nihon Shoki, an official record of ancient Japan, Emperor Tenchi ordered to build about 10 castles such as Onojyo castle (Fukuoka prefecture), Yashima castle (Kagawa prefecture) and Takayasu castle (Nara prefecture) around north part of Kyushu island and seashore of Setonaikai sea between 665 and 670. 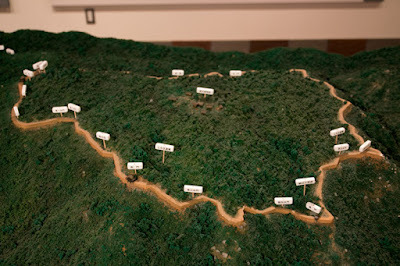 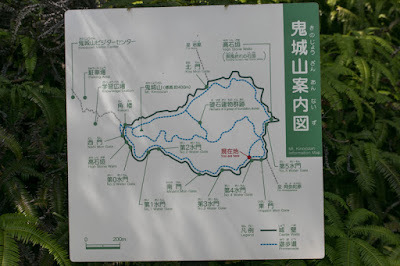 North part of Kyushu island had Dazaifu city, a vice capital of Japan, and was expected to be the first target of attack from foreign countries. Setonaikai sea was a sea lane connected Kyushu island and Kinki region, the capital of Japan, and considering immature navigation at that time invasion might be by ships proceeding along with coasts. 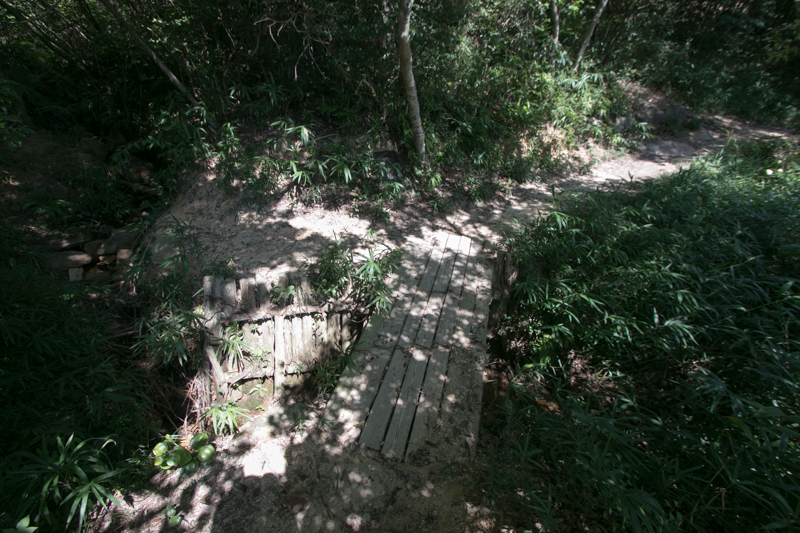 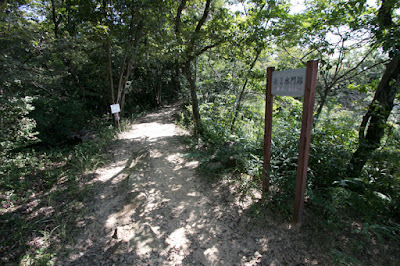 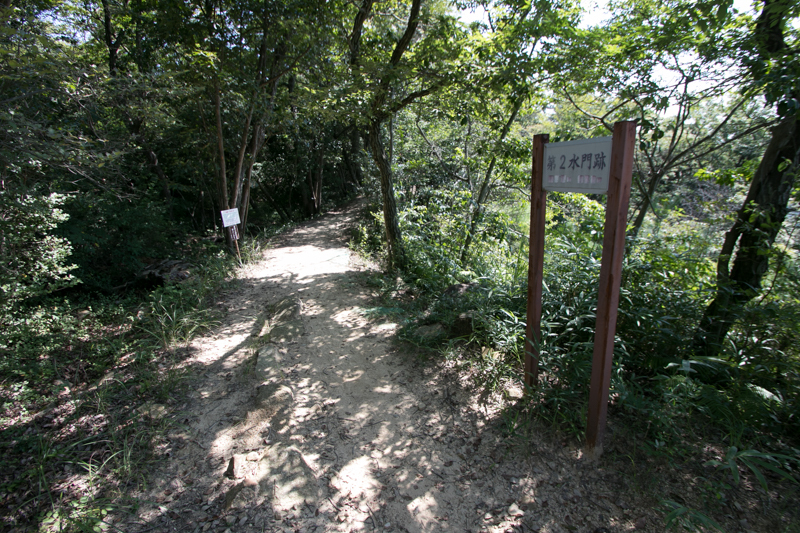 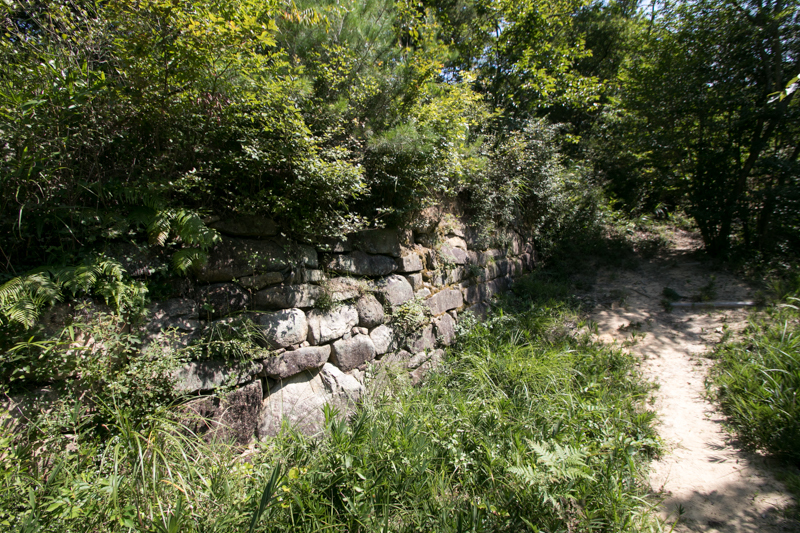 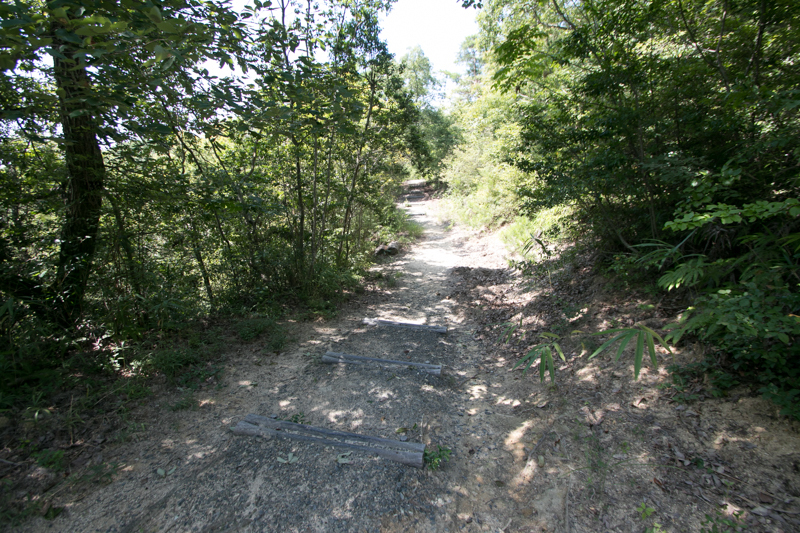 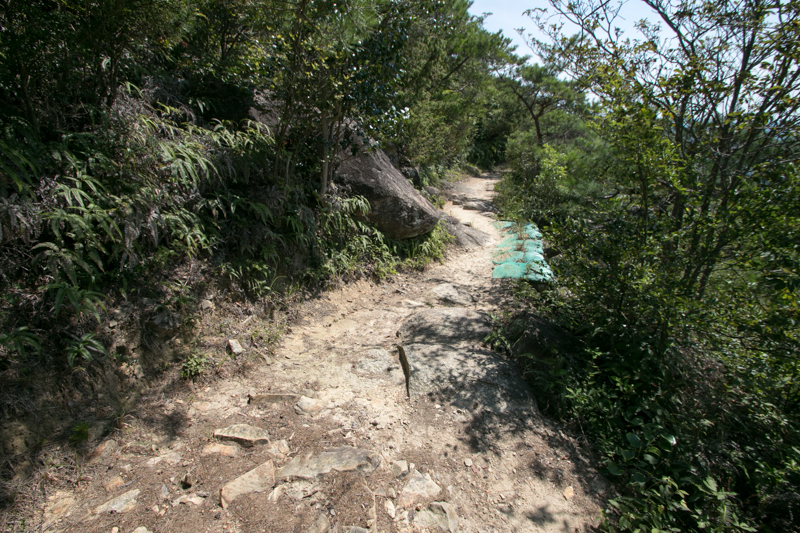 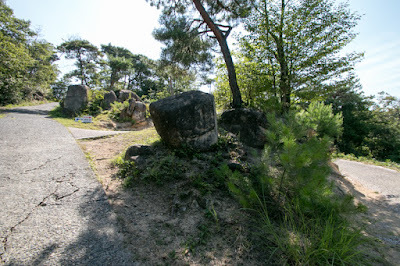 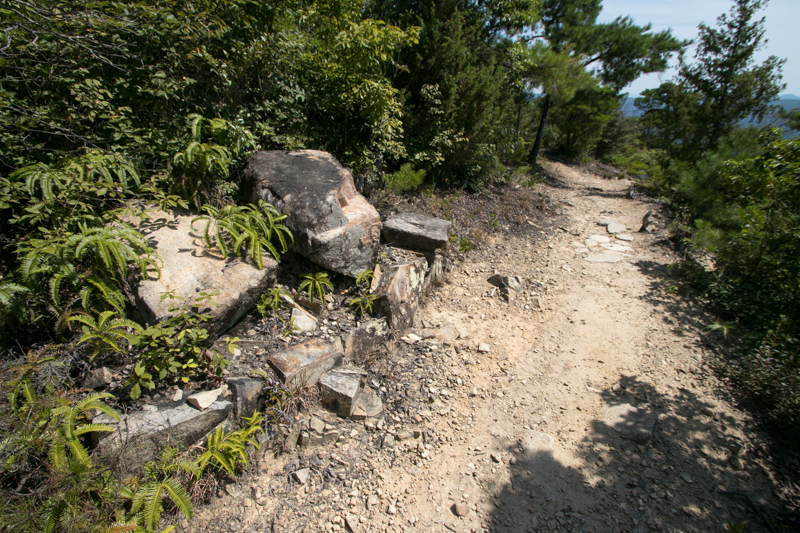 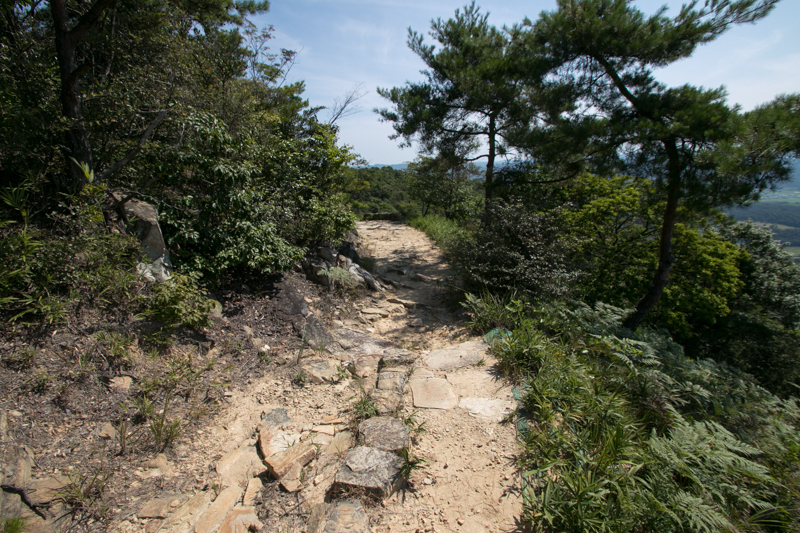 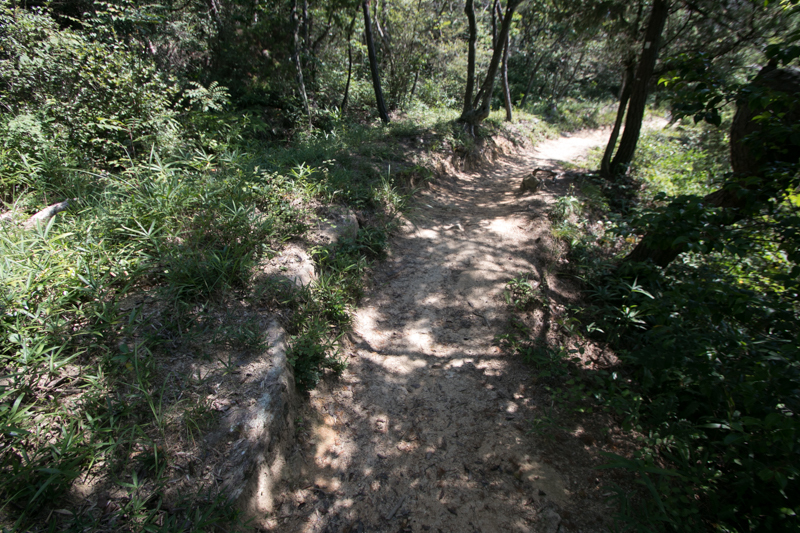 Construction of these castle were supported by technicians of former Baekje kingdom, and built in their way. 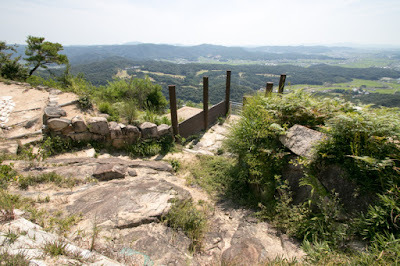 Thus these castles were called as Chosun (Korean) style mountain castles. 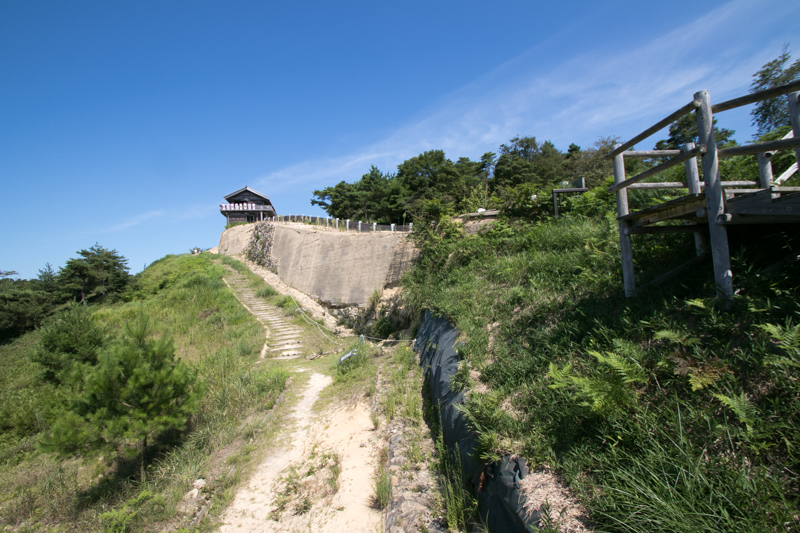 These Chosun style mountain castles were mainly built at the steep mountains with flat hilltop area along the coast, and a round wall built by clay and stone surrounded the hilltop area. 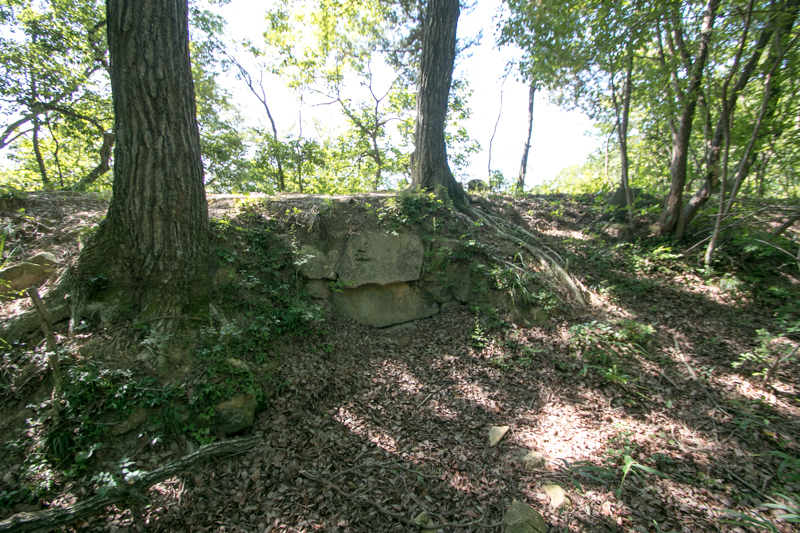 Especially the valley was the most probable intruding route and easy to collapse, these these valleys were guarded by thick stone walls called as "Suimon" (water gate). Inside the castle there were barracks, warehouses and armories, and entrances were guarded by turret gates. 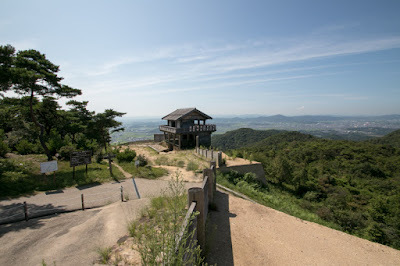 Compared with medieval mountain castles, there castles were isolated at the mountain and less considerate at counter attack. 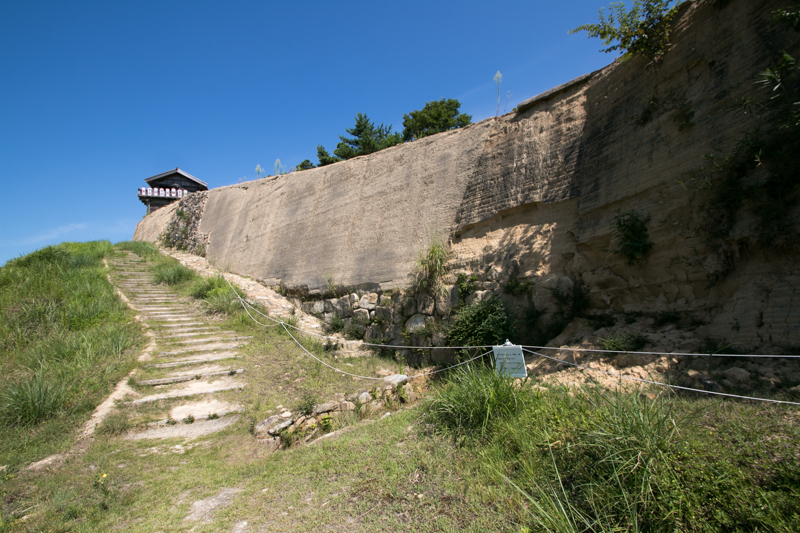 The purpose of these castle was to endure the limited period and gain time against large but short term attack of foreign armies. 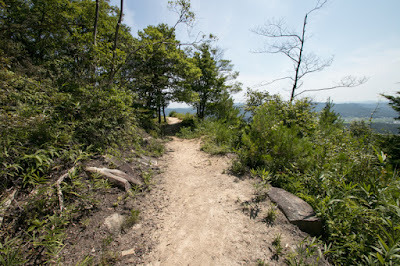 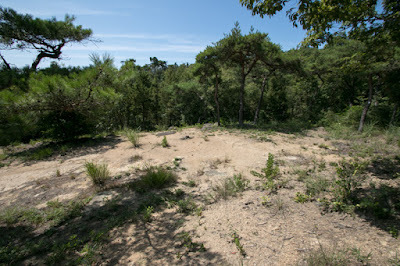 In addition to these recorded castles, even though unrecorded, similar castles were built at the connecting point of above recorded castles around this period. Kinojyo is one of these unrecorded Chosun style castles, and even though some of these unrecorded castle had only low walls and might be rather a religious place, Kinojyo castle is a genuine and large castle equipped with tall walls and secure gates. 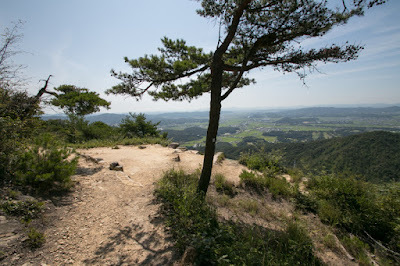 Kinojyo castle spread over ninth station of Kinojyo mountain, and the shape of the castle is a oval of 500 meter radius. 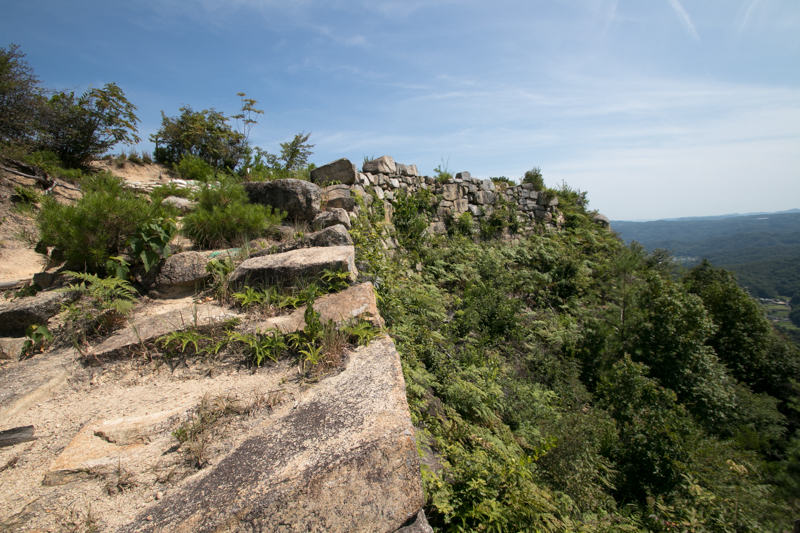 Total length of the wall is 2.8 kilometer, and basically built by clay using the cliff of the mountain but stone walls are used for strengthen weak points. 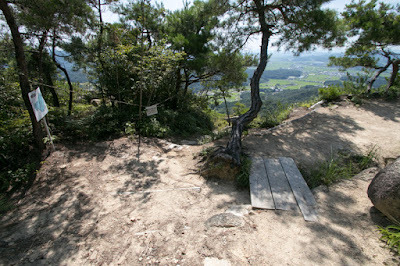 Four gate were built at each direction of the castle, and west gate connecting to the ridge might be the main gate. 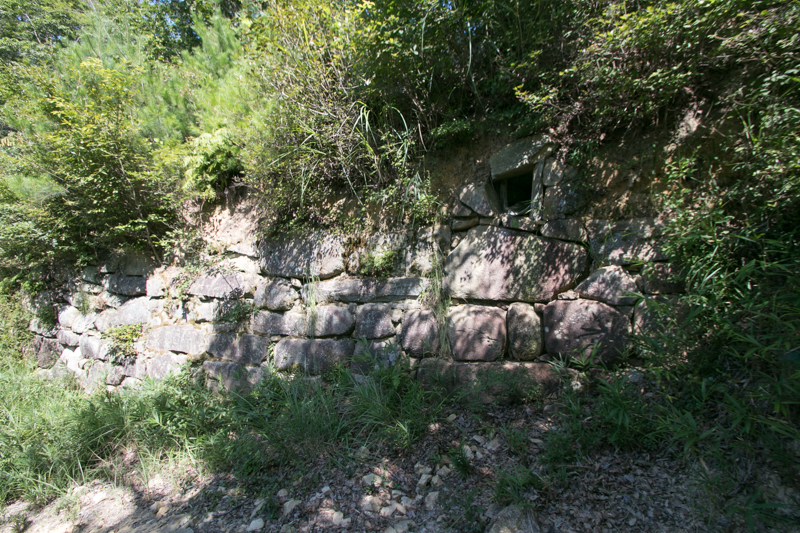 Castle walls were folded to enable side attack, and there might be seven barracks used for residence and warehouse. 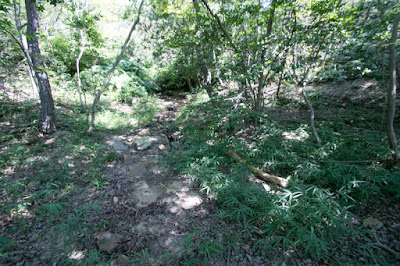 Inside the castle there were several ponds used for water source, and the ruin of smithy was also found. Kinojyo castle and famous tale "Momotaro"
As a result, Tang dynasty or Silla kingdom did not invade Japan at this time, and Kinojyo castle might be abandoned soon. 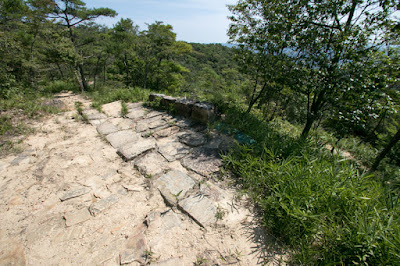 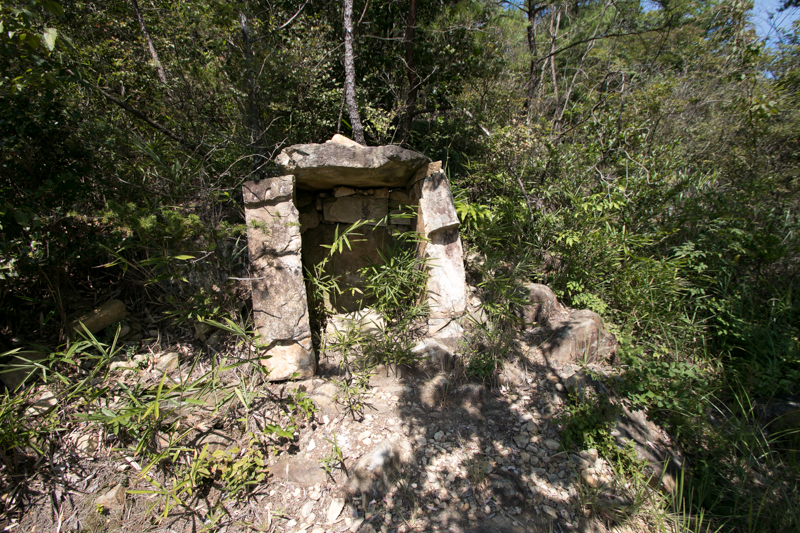 Ruin of castle built in unfamiliar way evoked imaginations of people in later period, and finally connected to the famous tale “Momotaro”. 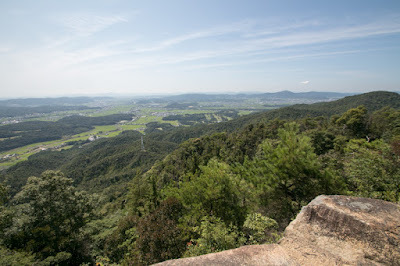 Momotaro is a tale that a boy born from the huge peach came floating down the river grew up and conquer the castle of devil lead three fellow animals, it mean dog, monkey and pheasant. 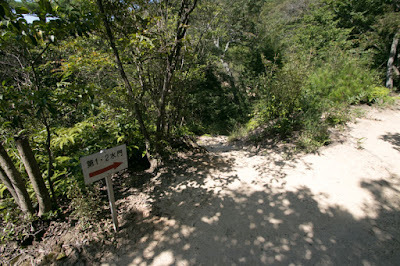 Kinojyo castle was regarded as a castle of devil in this story, and Kinojyo means the devils’s castle. 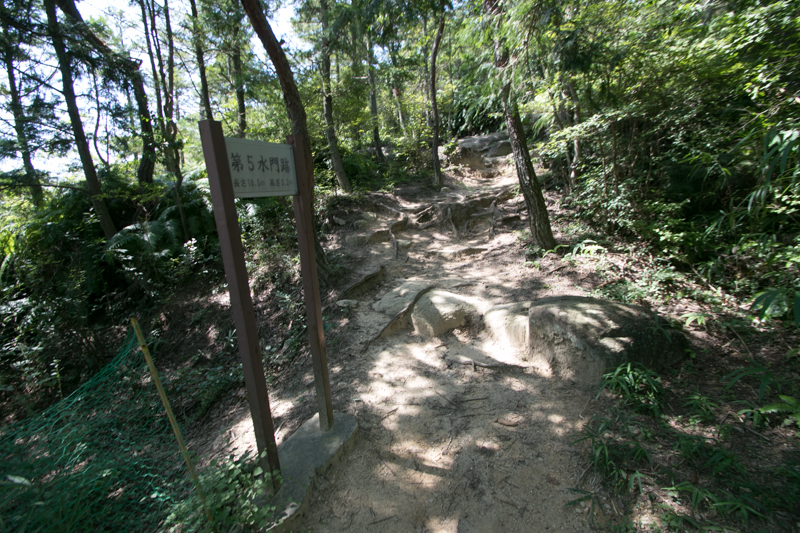 The motive of this story is said as a conquest of ancient Kibi kingdom by Yamato dynasty in 4th century, just applicable to this area. 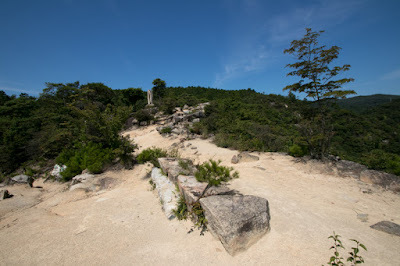 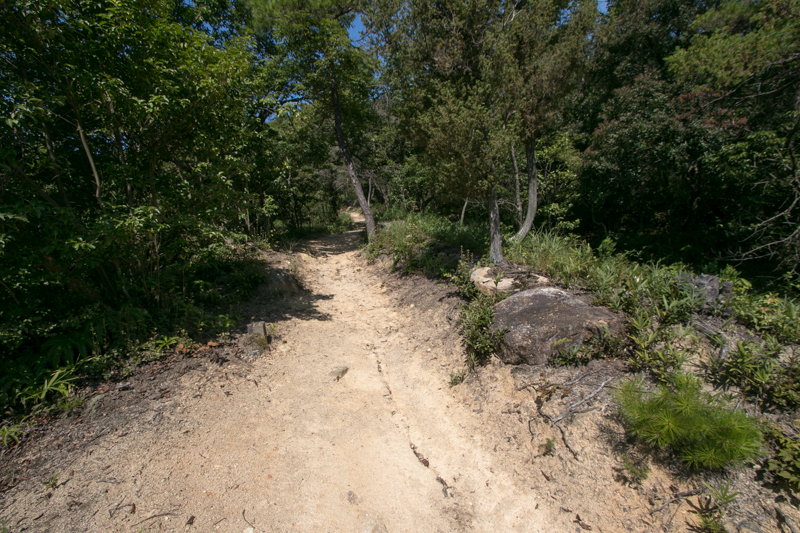 The timing of original story and construction is clearly different, but secure castle at the top of steep mountain, with huge rocks built in unfamiliar way, is completely suit as the image of the devil of the castle. 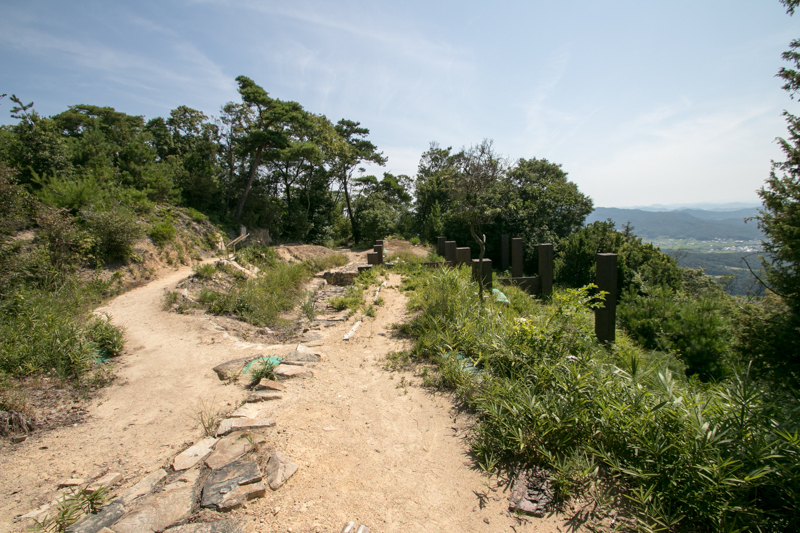 The ruin of the castle had been forgotten for long time, but after WW2 investigation of castle sight has proceeded and the magnificent shape of ancient mountain castle was gradually revealed. 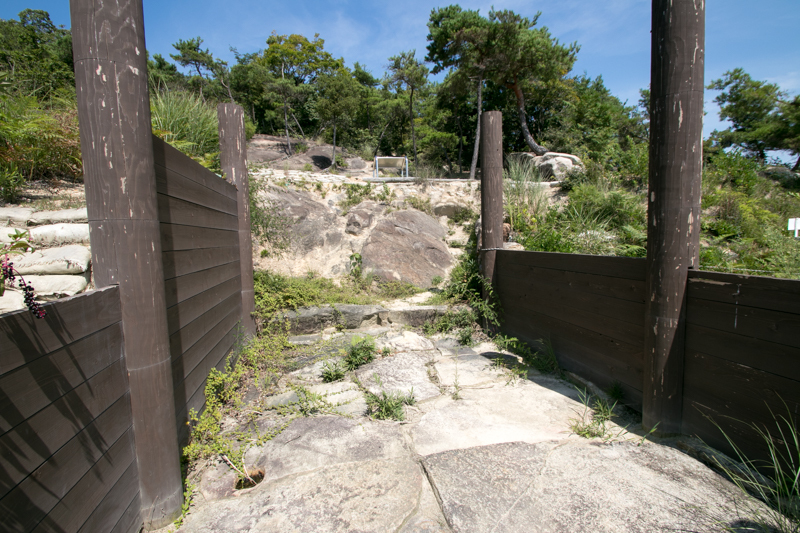 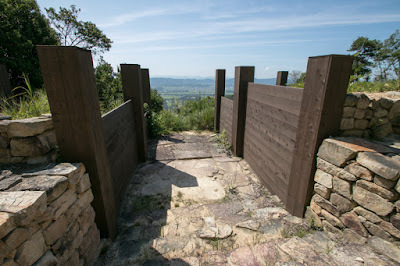 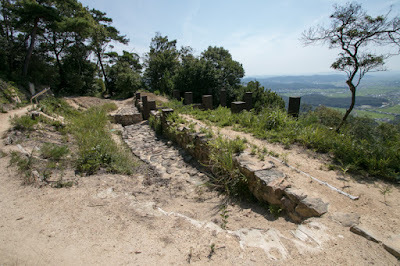 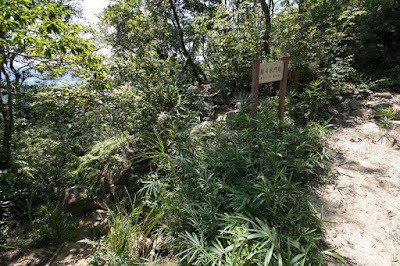 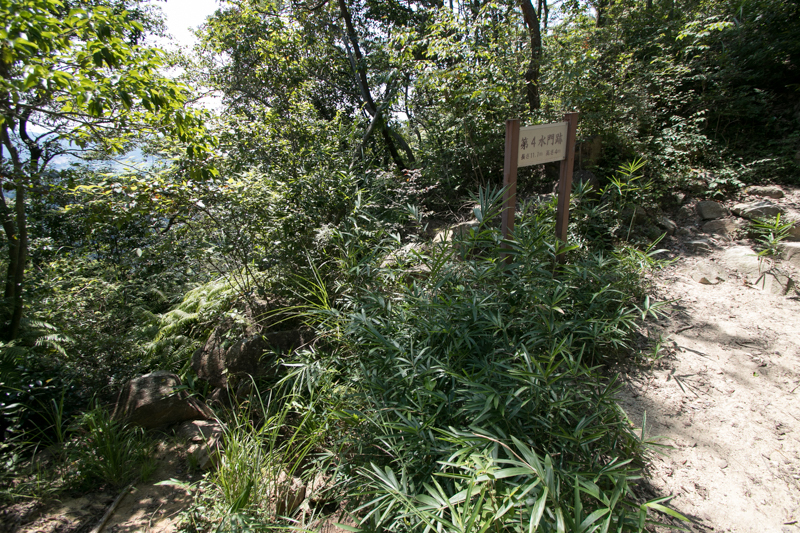 Now main gate was reconstructed with broken walls, and castle ruins on the cliff shows an insight of severe tension occurred in East Asia in 7th century. 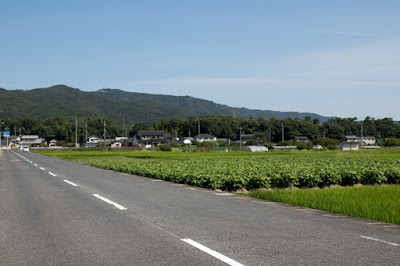 20 minutes drive by taxi from JR West Hakubi line Sojya station. 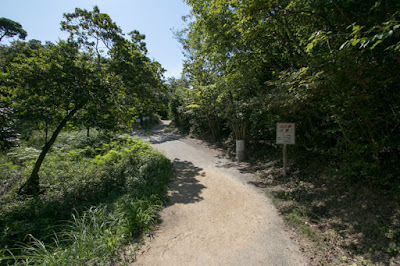 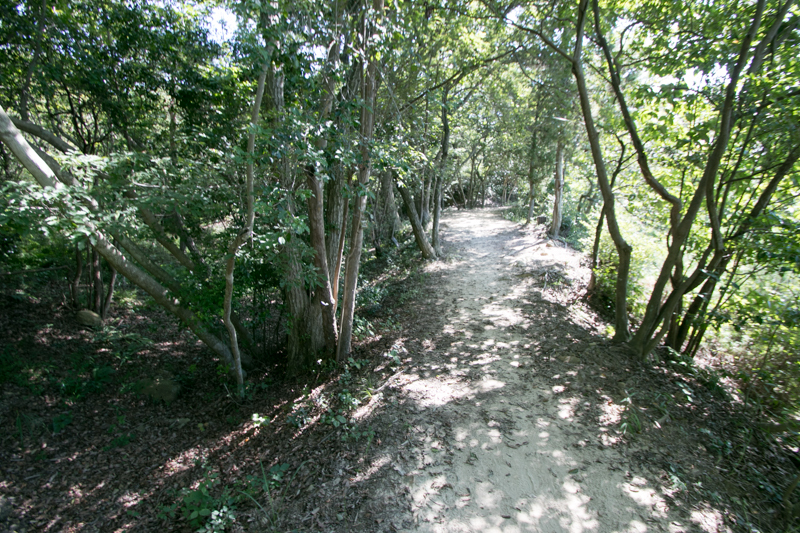 30 minutes drive from Sanyo Jidoshado Expressway Okayama-Sojya interchange. 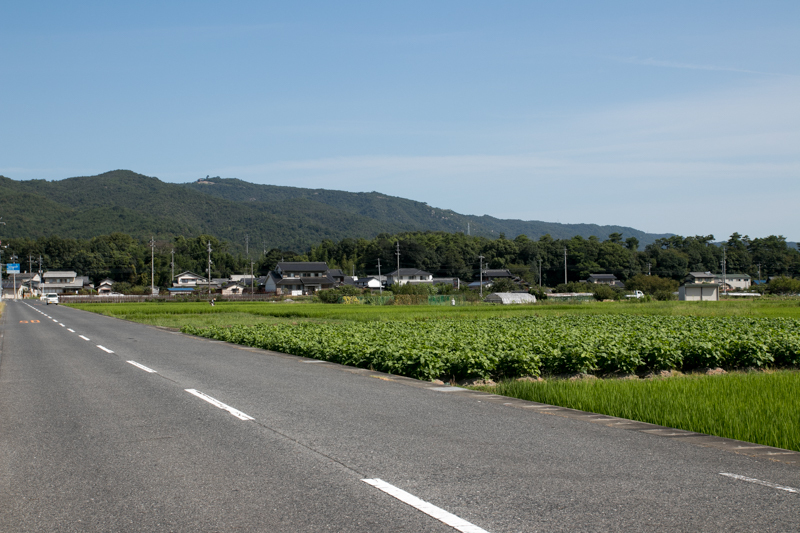 Car usage is a safe bet.